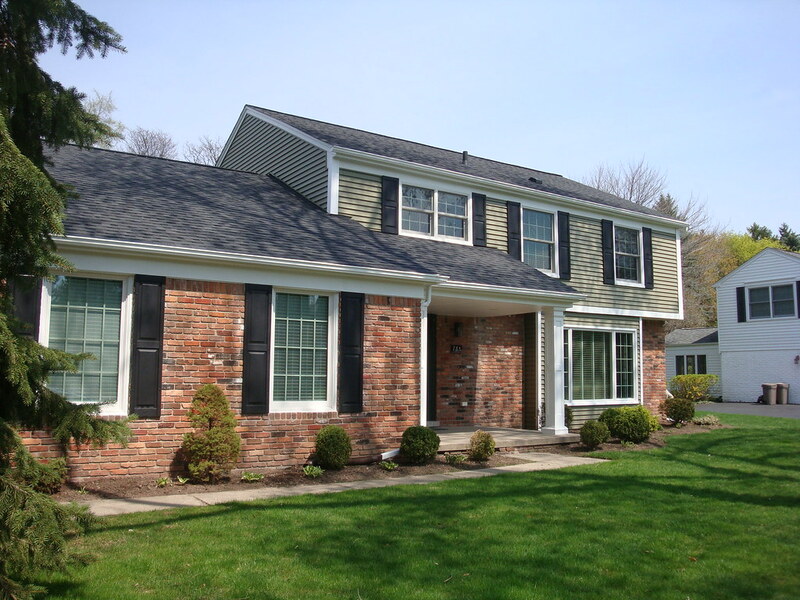 Home improvement and exterior renovation work that you can trust to last for years to come. 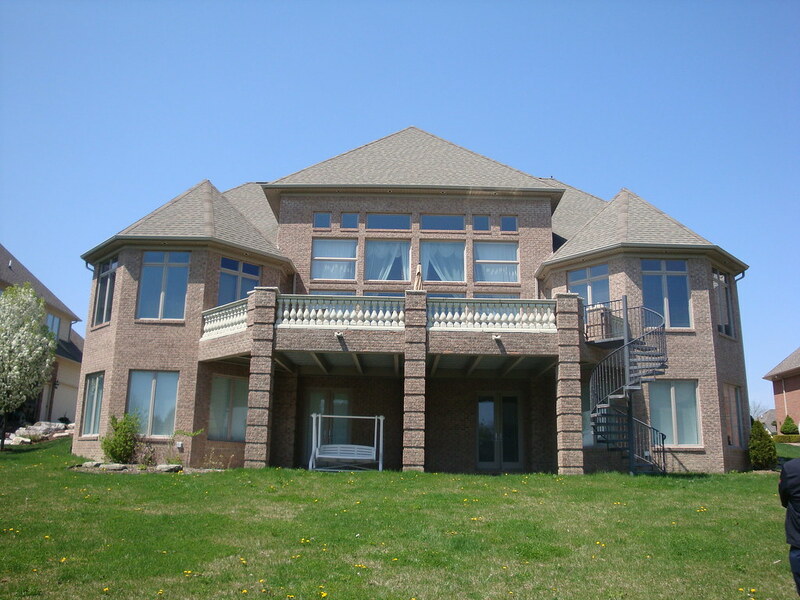 Being in business 25 years gives our team of highly skilled, constantly trained and very knowledgeable craftsmen and major advantage. 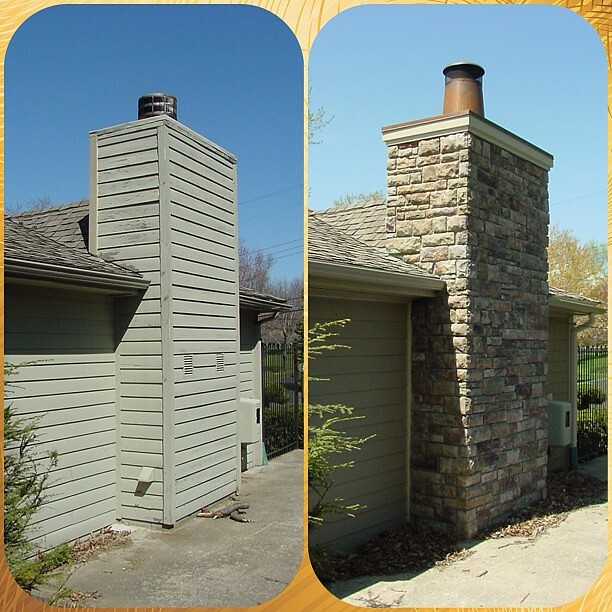 We use only time tested products and utilize the latest technology available to ensure your job is engineered to last a lifetime. 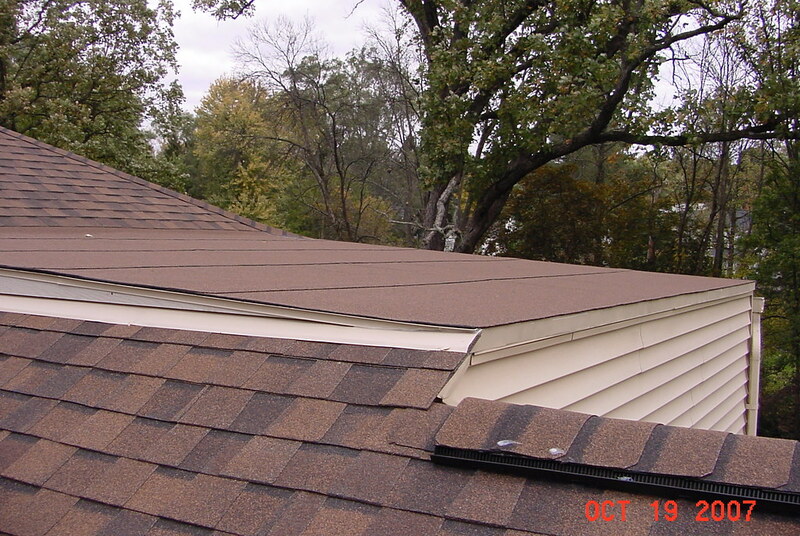 We are a Residential & Commercial roofing contractor with 25 years of experience. 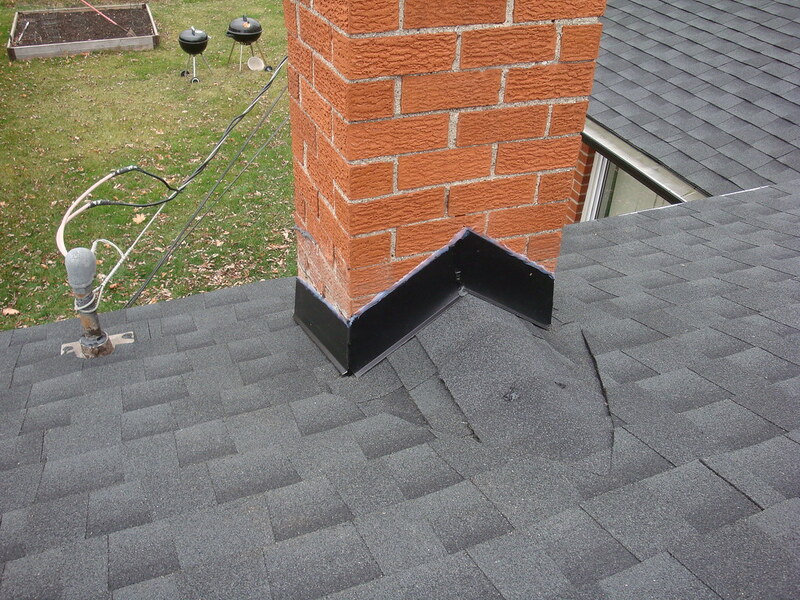 We utilize the latest technology available to track leaks that can’t be found by the naked eye. 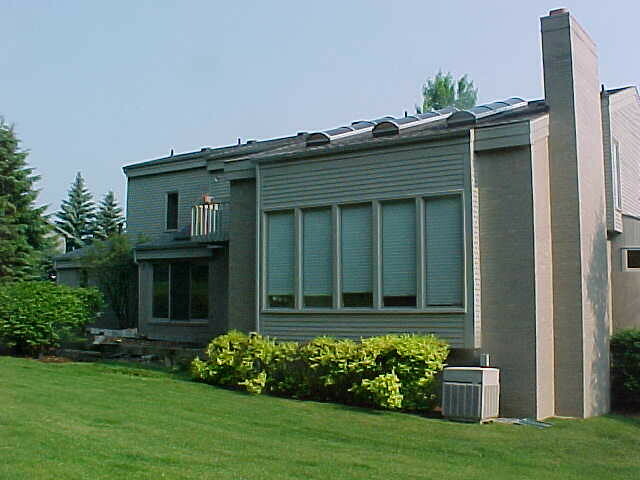 Infra-Red Thermography and Drones are a few ways we differentiate ourselves from the competition. 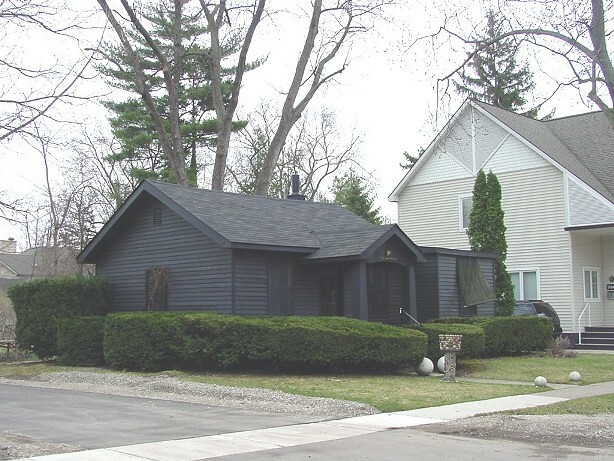 This house with an old 3-tab shingle on it. 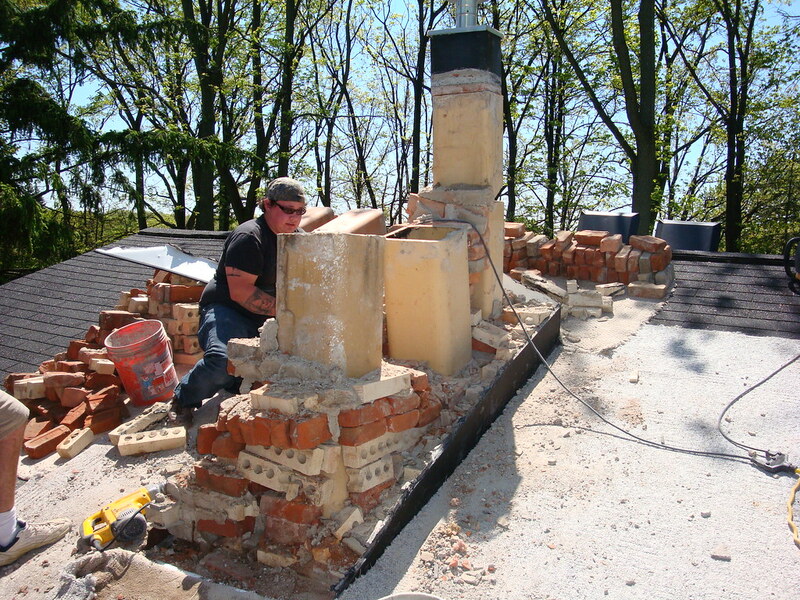 As you can see here the area behind the chimney called a cricket or saddle was a trap for debris and snow. 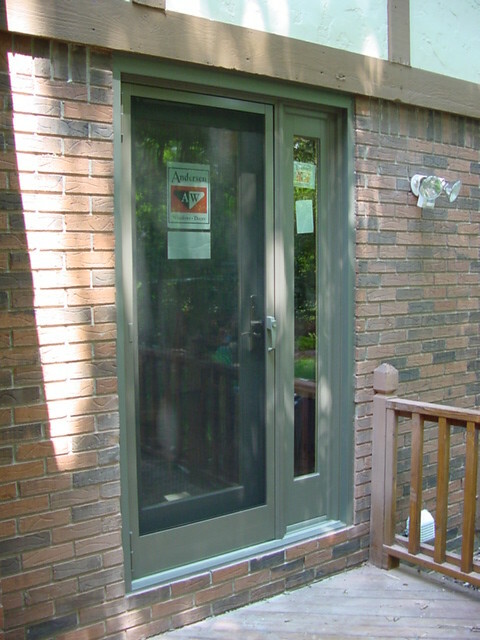 Also the counter flahsing was poorly done. 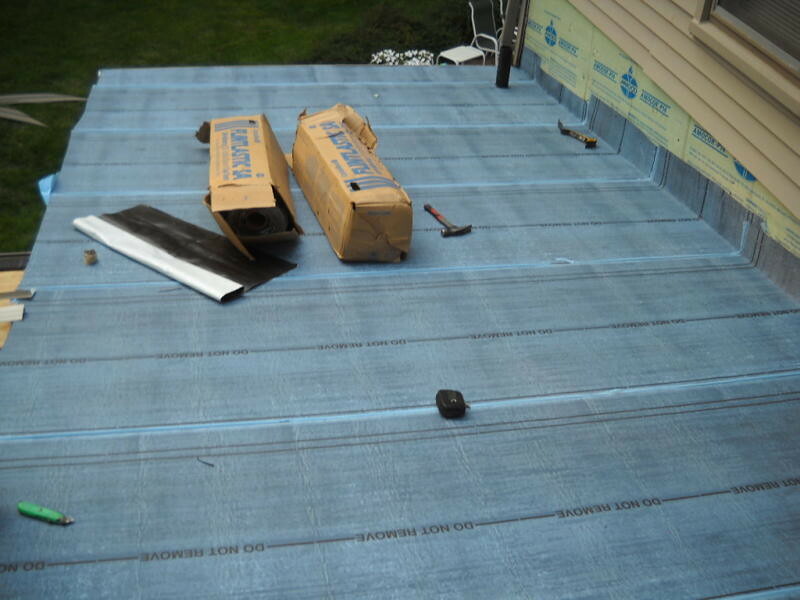 We changed the pocket area so the water would run out past the corner and intsalled a new step and counter flashing as well as new shingles and flat roof. 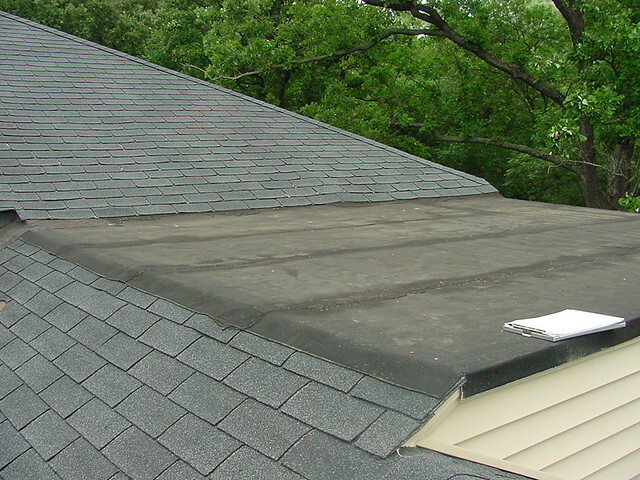 This flat roof was holding water and constantly leaking. 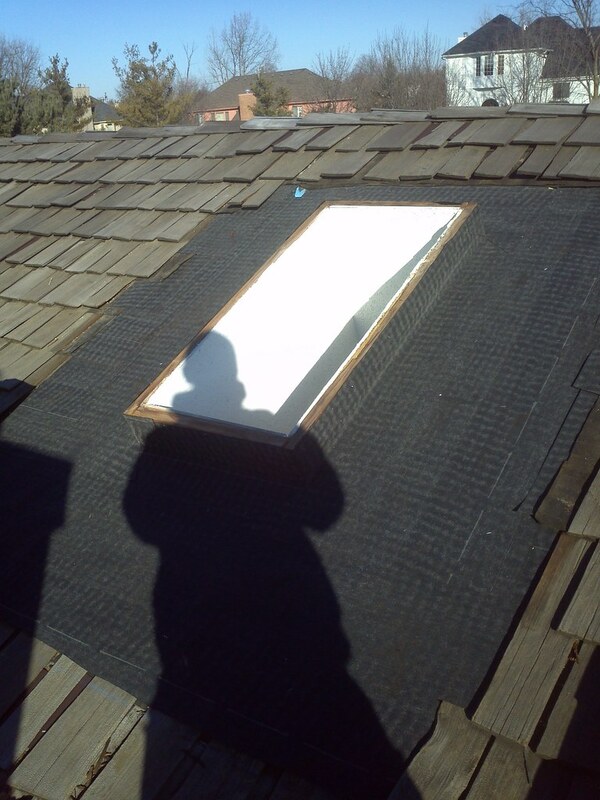 We removed the plywood and raised the pitch so the water will flow off and not sit and freeze. 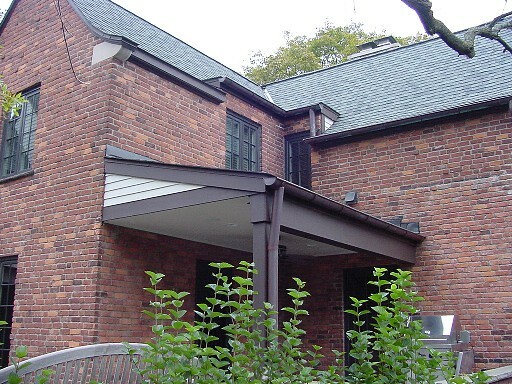 A beautifully constructed flat roof that has not leaked since we built and roofed it back in 2007. 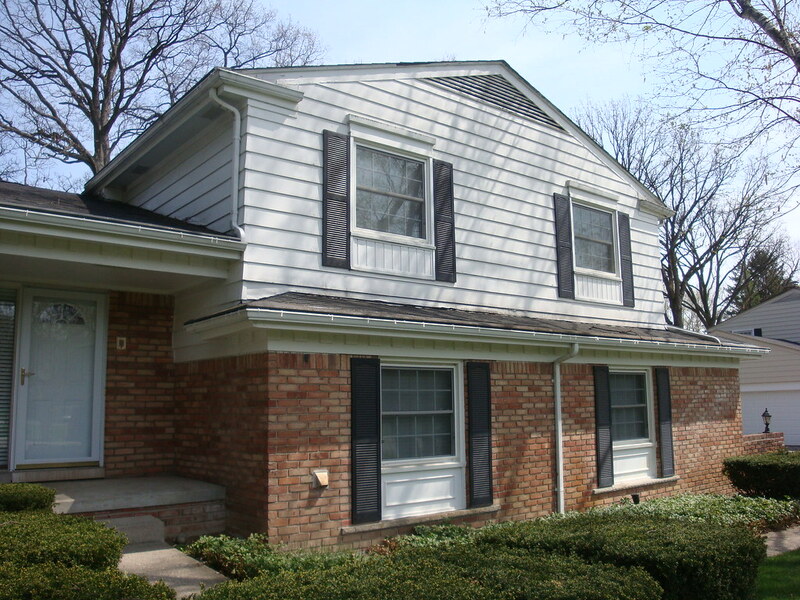 New Certainteed Independence Shingels (Colonial Slate) with Flintlastic single ply rubber roof to match over the front porch. 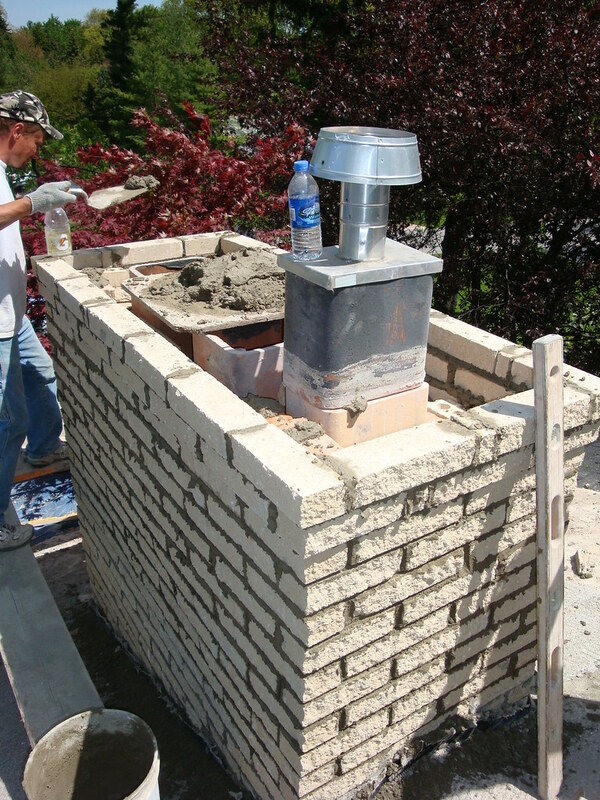 Here you can see the saddle is construced and ice and water shield membrane in installed around all sides and up the side walls of the chimney before the step flashings are installed. 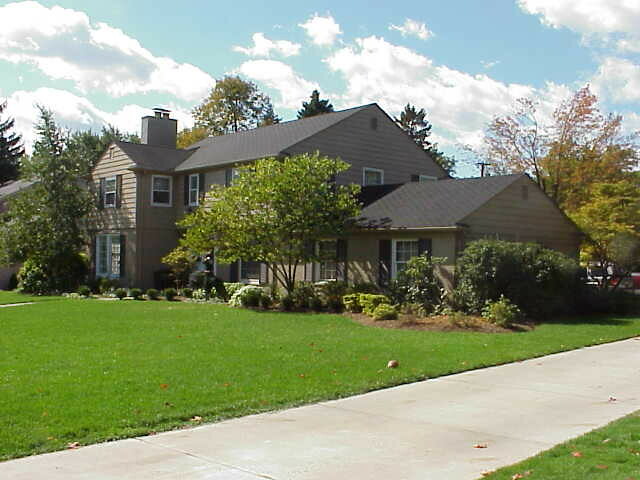 This is the finished product. 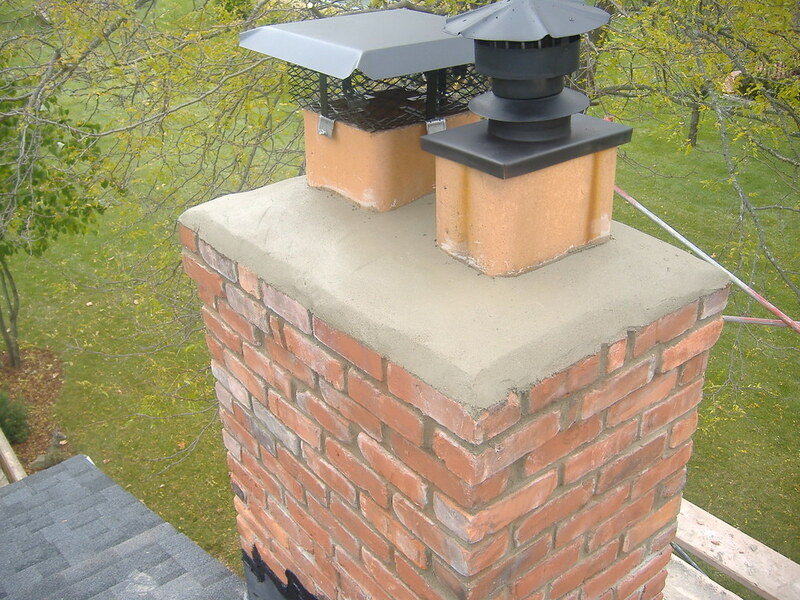 A new saddle to direct the flow of water around the chimney, new step and counter flashing cut into the brick, and a new Landmark Moire Black roof. 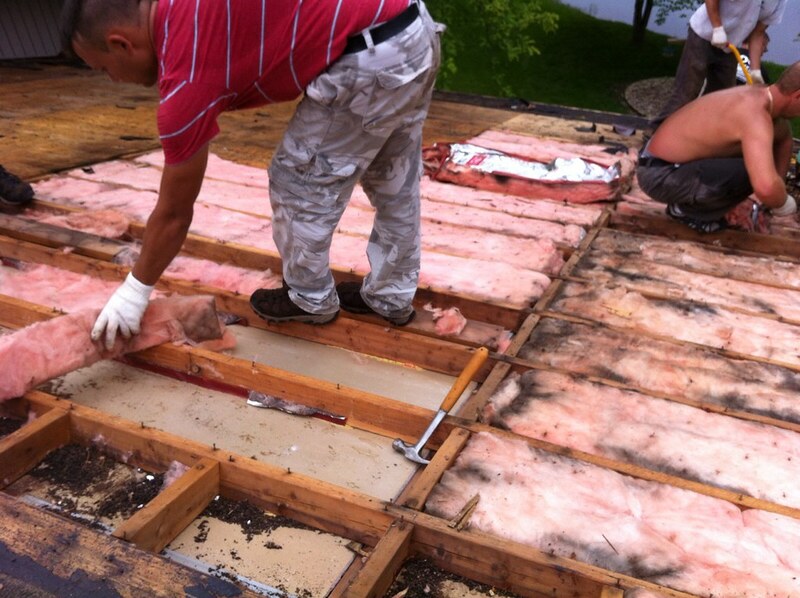 We had to remove the insulation here as it got wet. 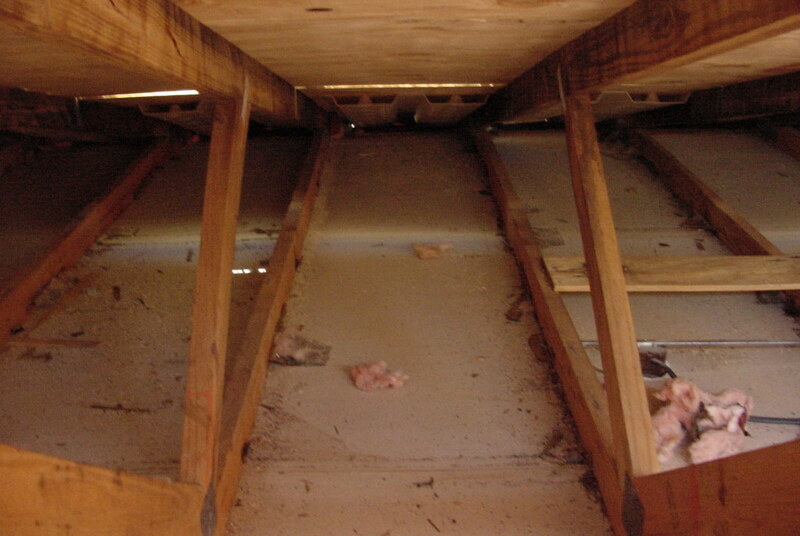 If you look down at the bottom of the rafter you can see the baffles properly installed before we blow in the new R-49 insulation. 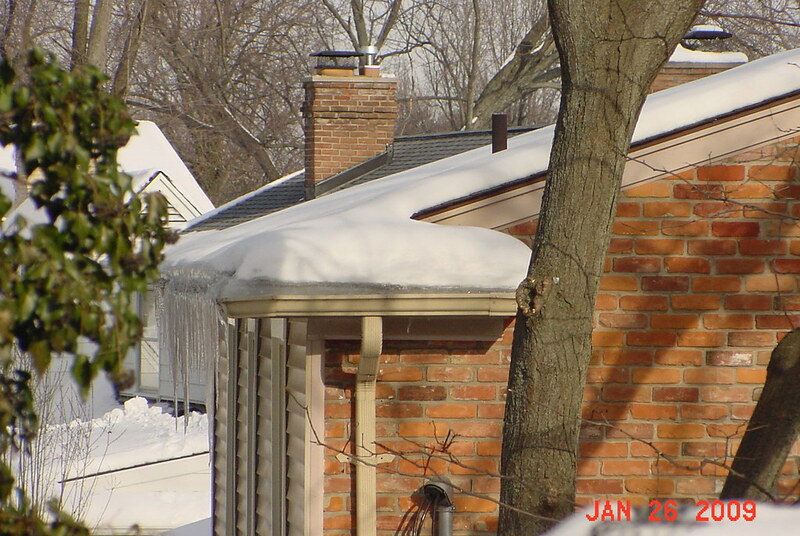 Here is a house with an ice dam caused from not enough intake and exhaust ventilation (It's not our job)! 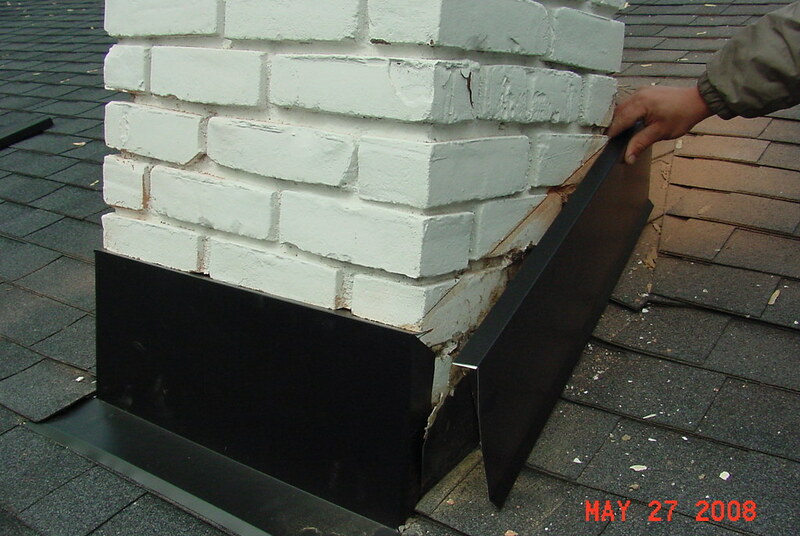 We always cut and tuck our counter flashings directly into the brick as you can see here. 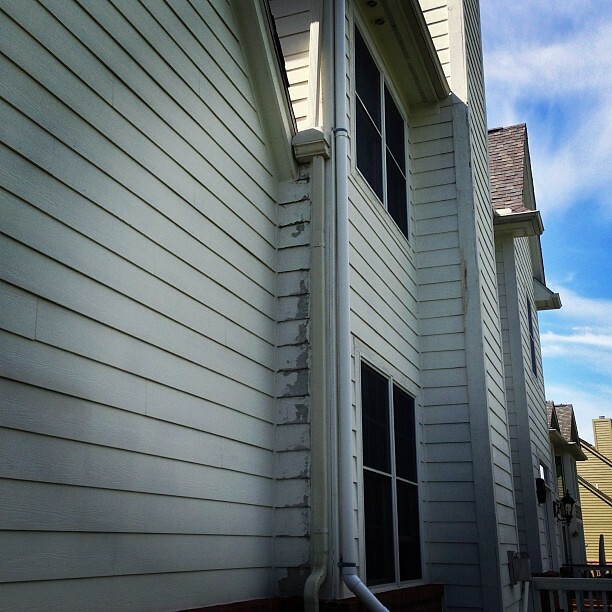 Then they are caulked into place. 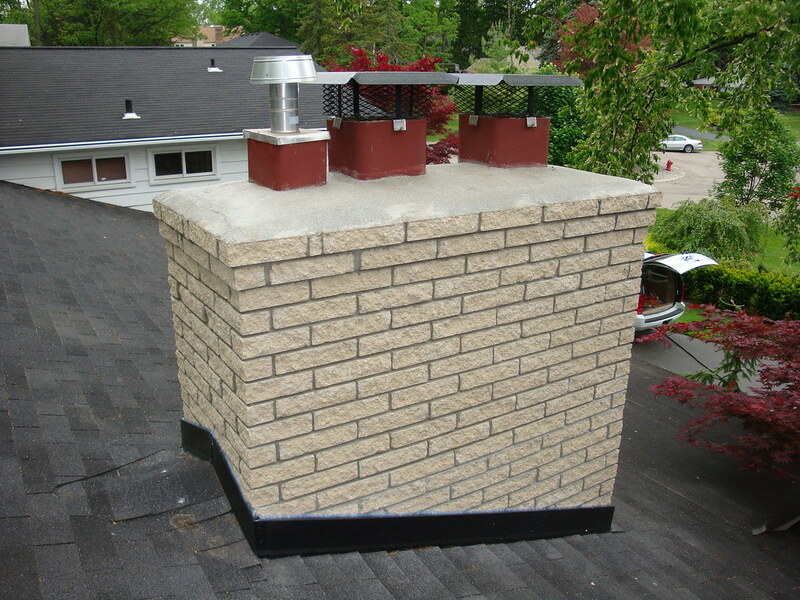 This bath fan should be vented directly up through a dedicated roof/bath exhaust vent. 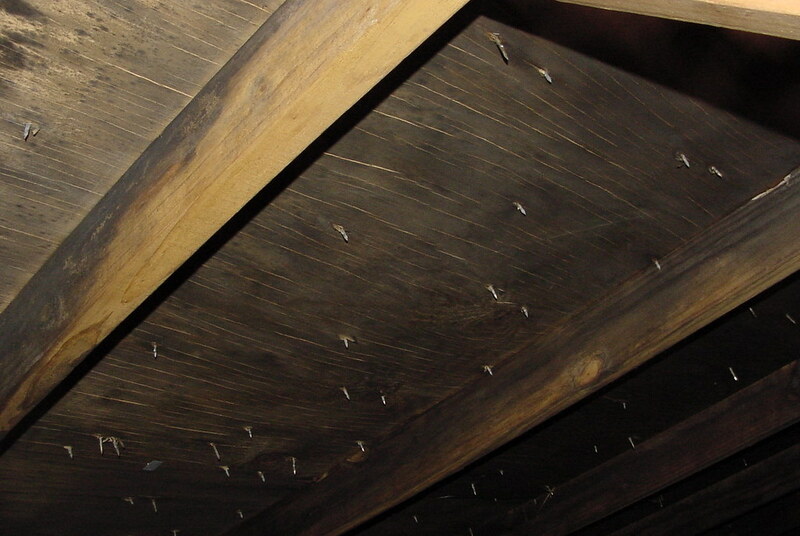 When they exhaust into the soffit moisture can diffuse up and rot the roof decking as you can see here. 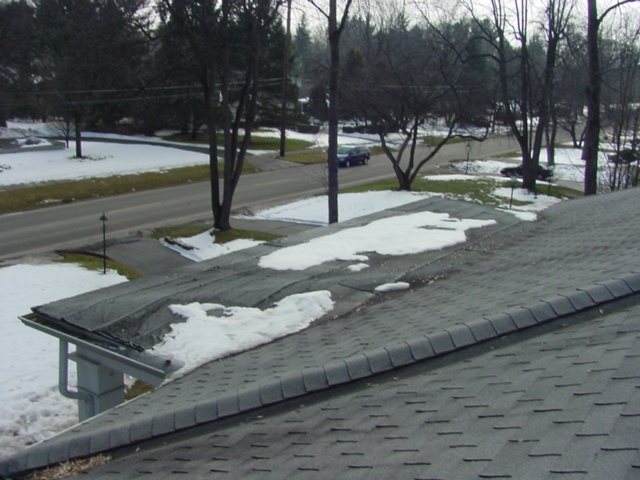 The homeowner called us out for a simple roof leak in the winter time. 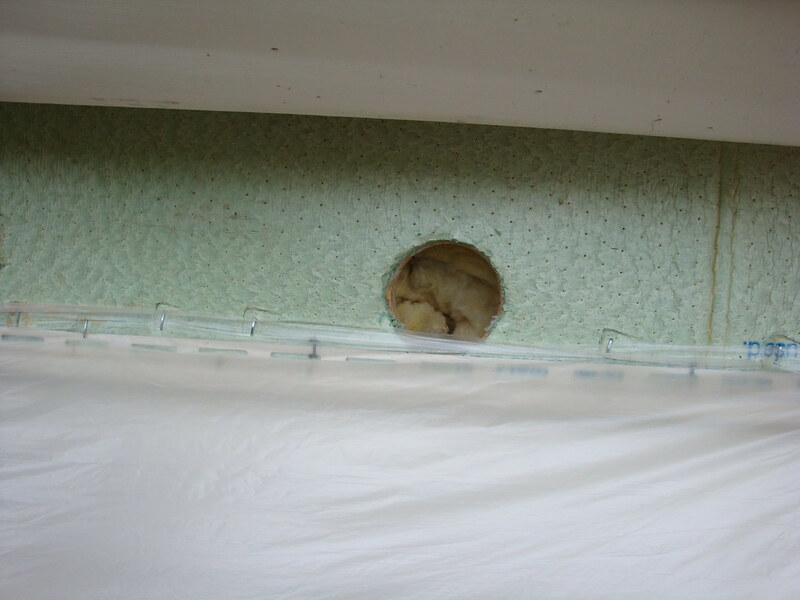 When we opened the attic access this is what we found. 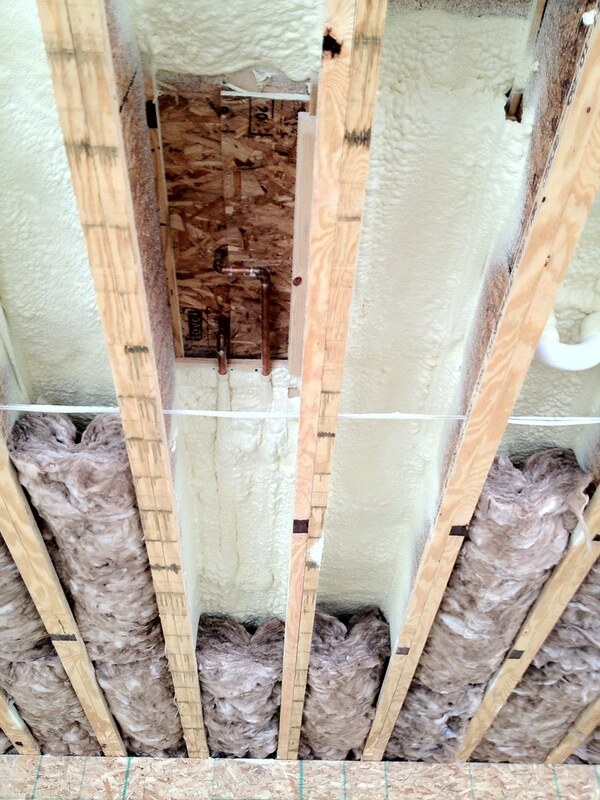 All caused from two bath vents pumping into shower moisture into the attic with not intake ventilation. 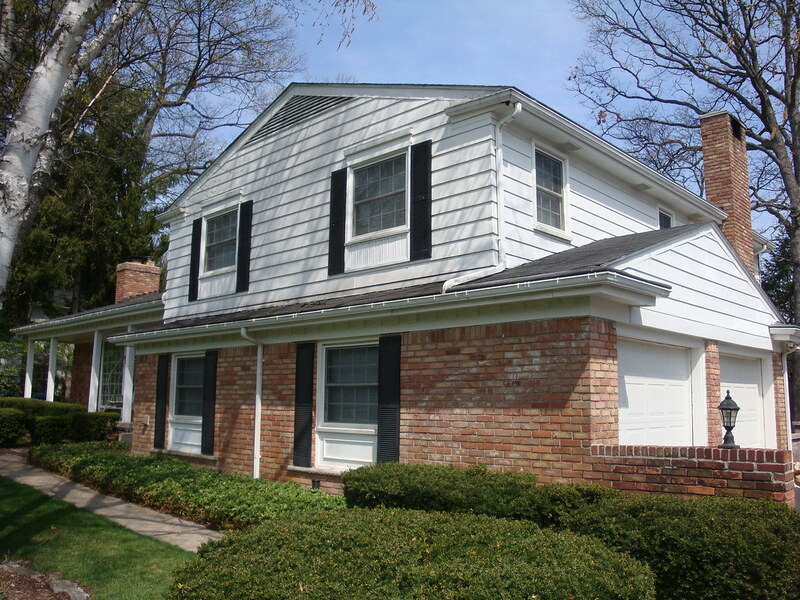 The front view of this new roof. 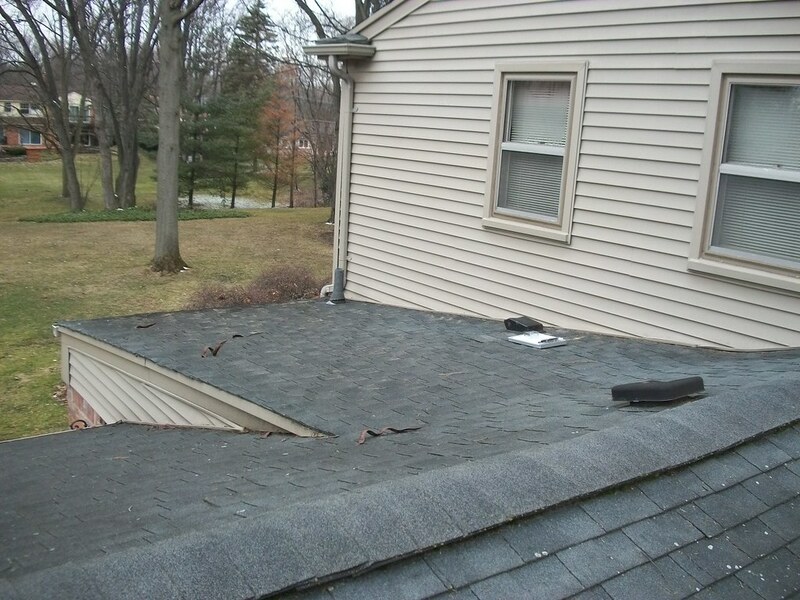 The back side of a large roof job in Shelby Twp. 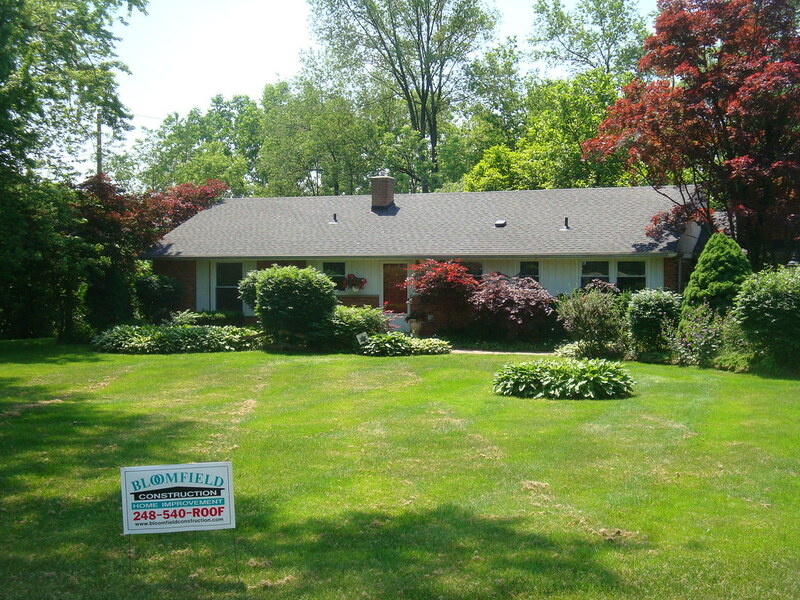 Tired old leaky 3 tab shingles on this Bloomfield Township ranch. 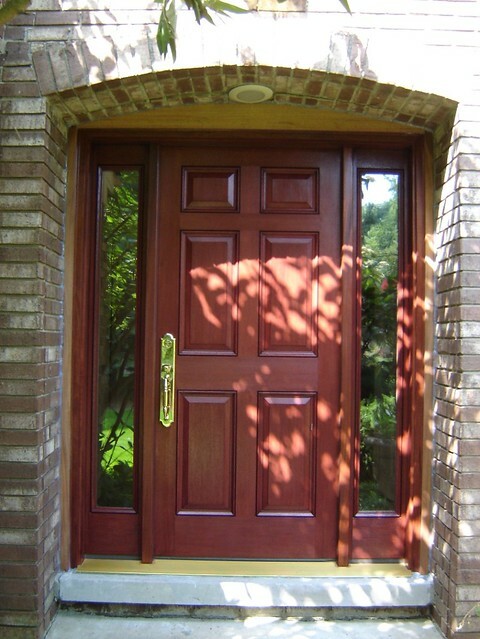 We offer a full line of pre-stained wood sidings, built to withstand harsh weather in Southeast Michigan. 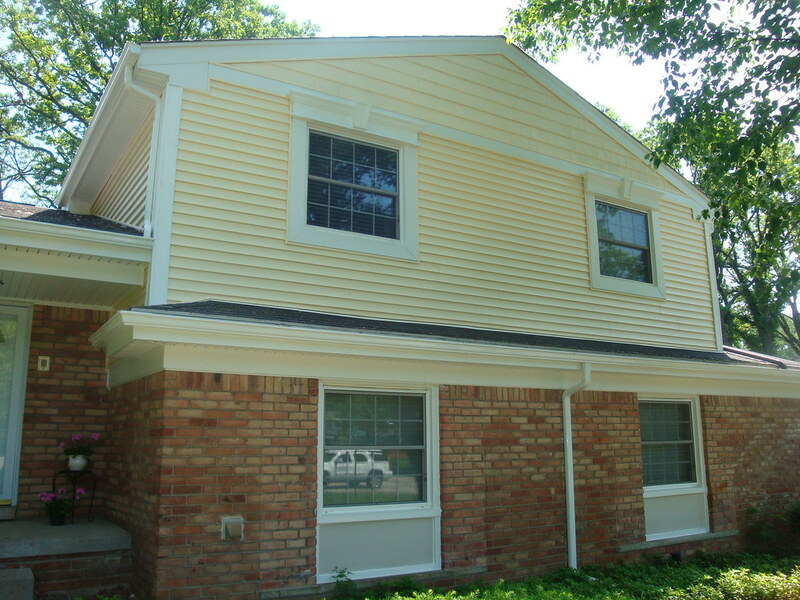 Pre-stained and Pre-painted options hold the finish up to 3 times longer that field applied paints in most cases. 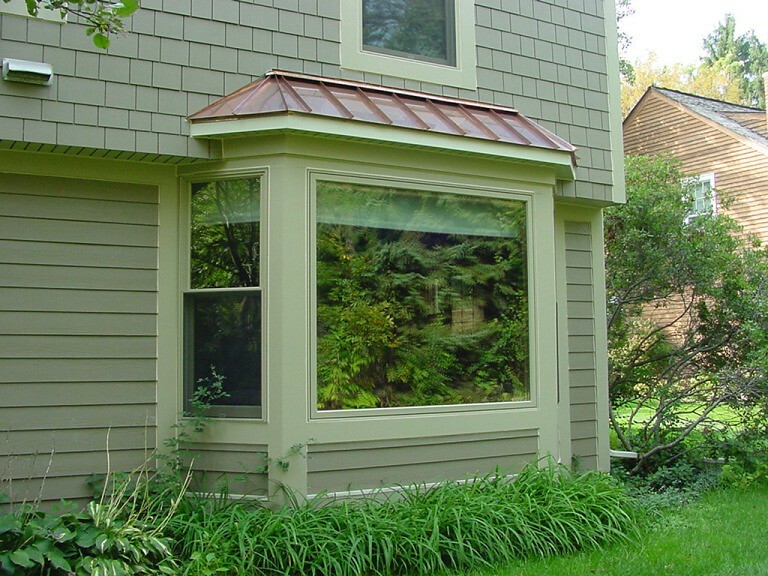 Cedar siding with cedar shingles in the gable end. 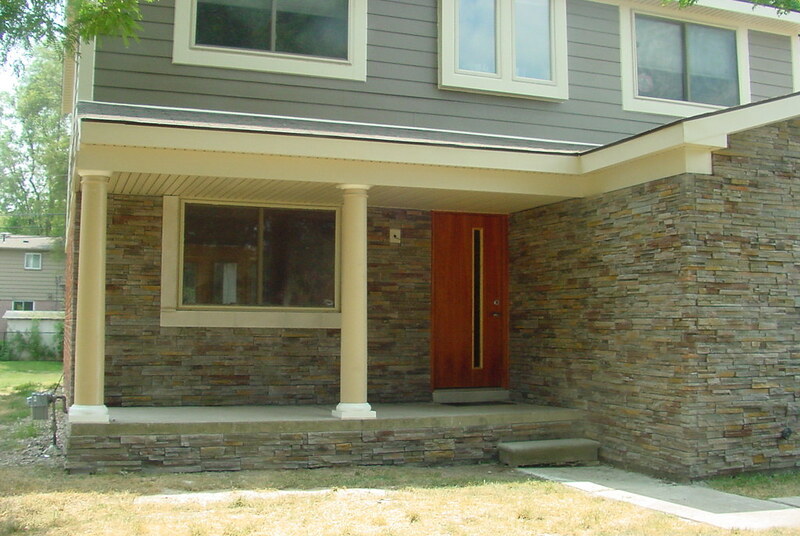 An angled shot of the front of the cultured stone and cedar shingles. 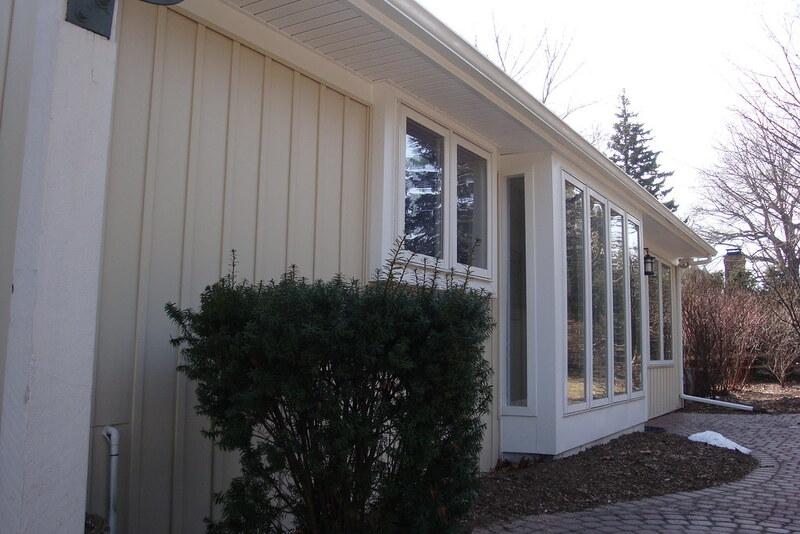 This is the back view of the White Lake residence with cedar lap siding. 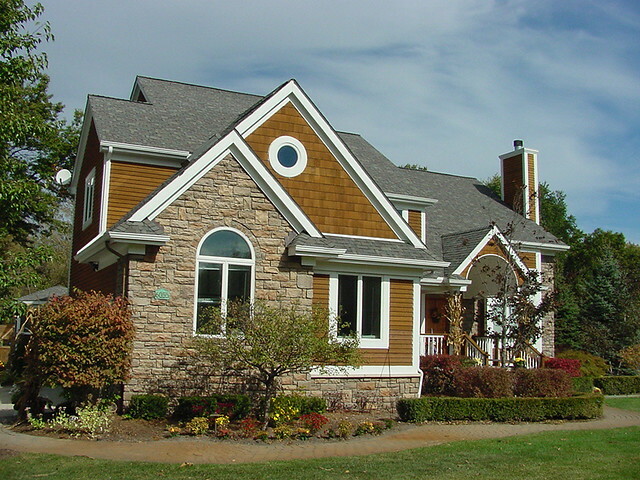 Cultured stone with cedar shingles and 6" cedar bevel siding. 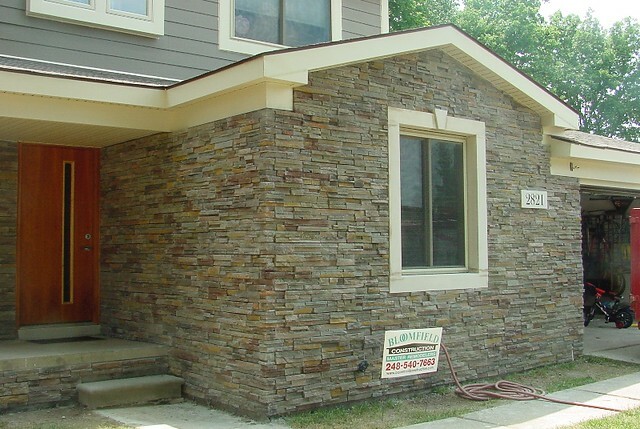 Thin stone and brick veneers and a great way to add amazing curb appeal to the front of your home or building. 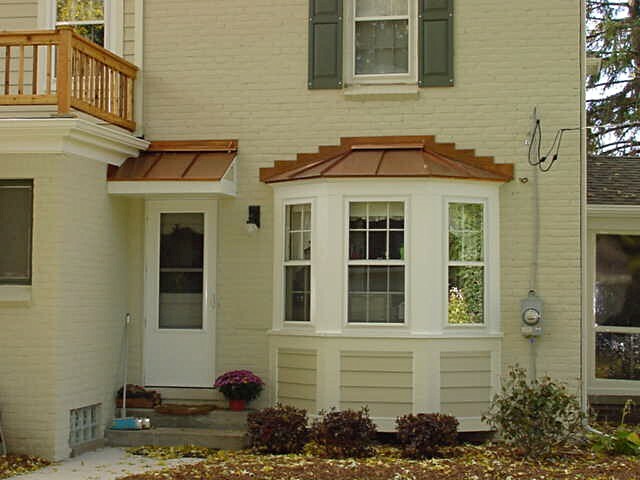 We offer a full line of real and cultured products that are very affordable when renovation your exterior. 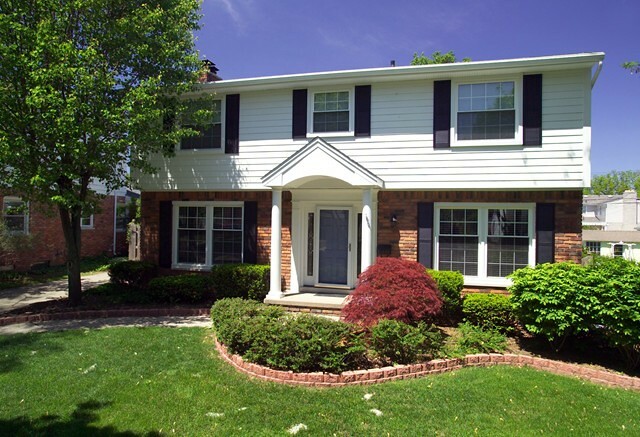 I loved the 80's too, but this Troy Colonial needed some serious help. 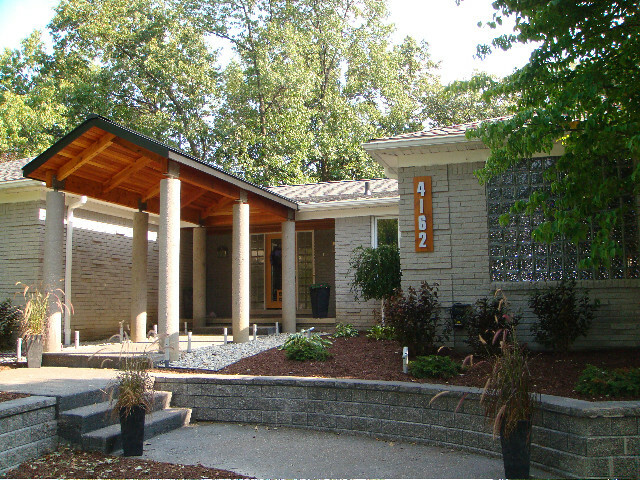 The 21st century looks is much better! 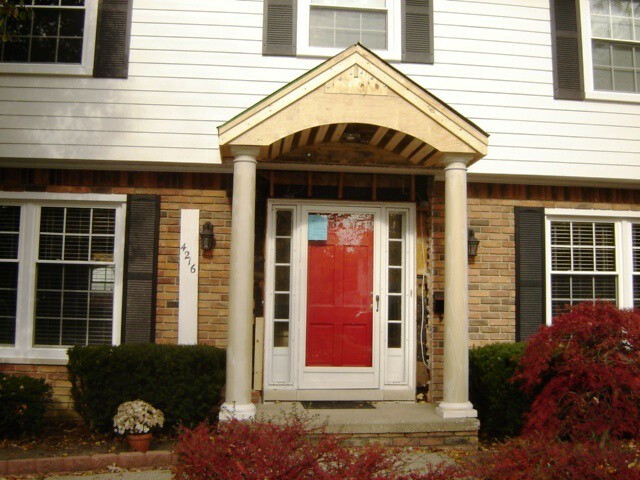 We added a nice 6" limestone accent around the window with a keystone above and an address block. 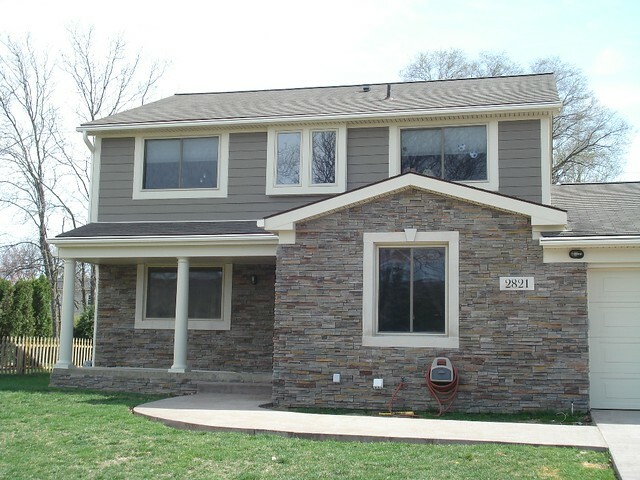 James Hardie sidng and owens corning cultured stone. 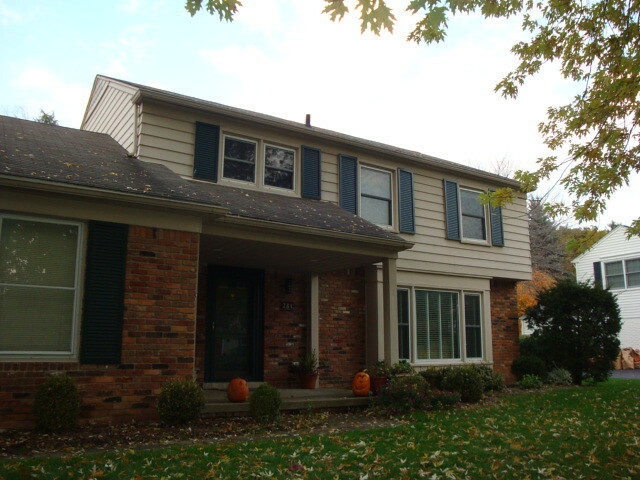 New Limestone trim around both front lower windows and new Perma Cast porch columns. 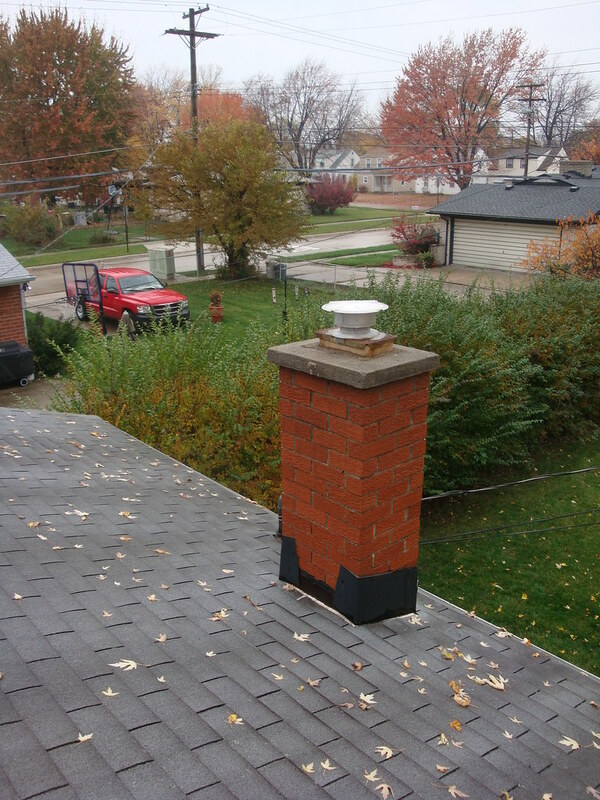 The before photo with damaged mortar joints and a leaky slope wash collar. 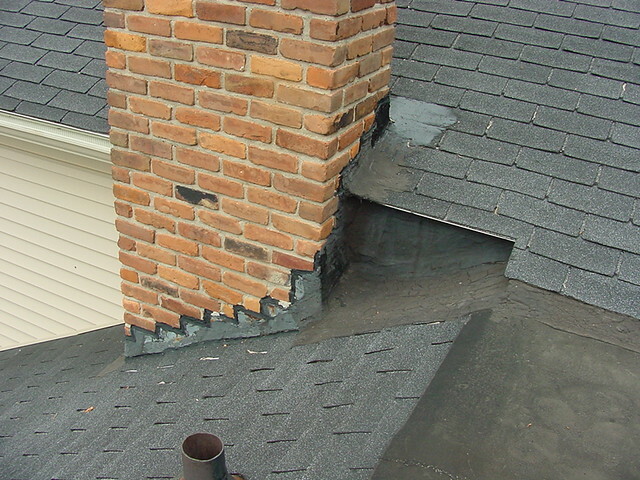 The brick on this chimney was saturated and leaked after every hard rain as it just absorbed water like a sponge. 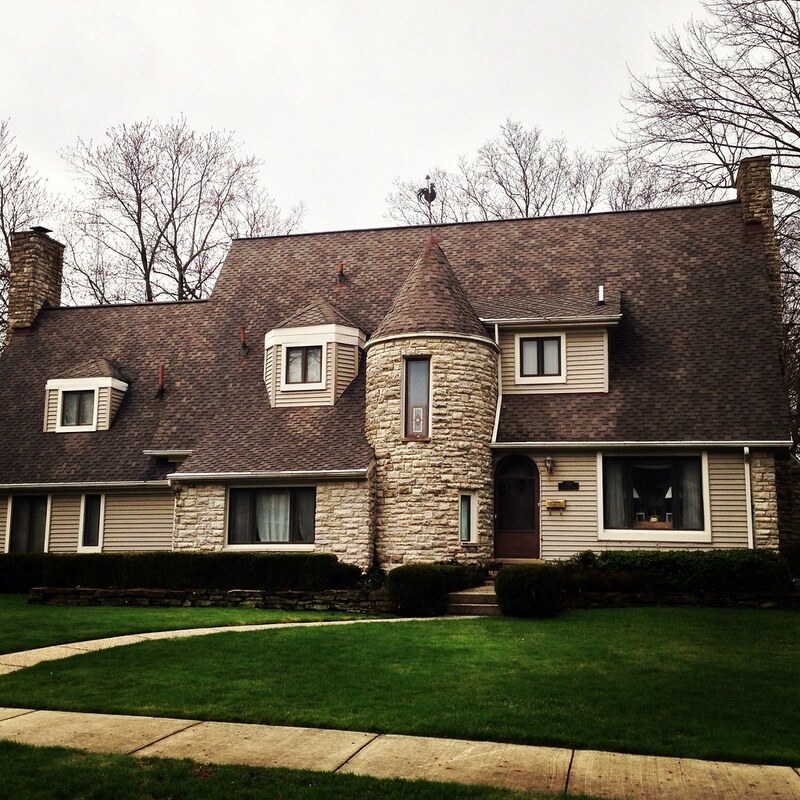 We took it down to the roofline and rebuilt the entire thing. 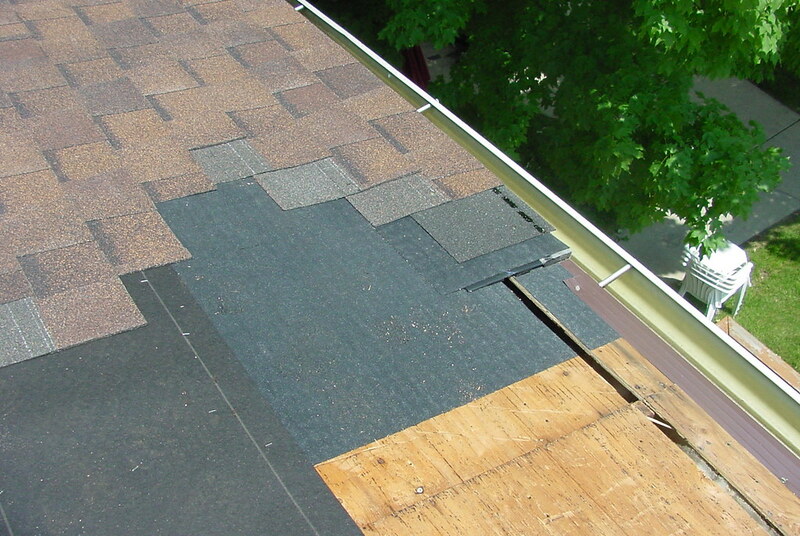 Almsot done here, just filling it in and getting ready to put the new slope wash collar on top. 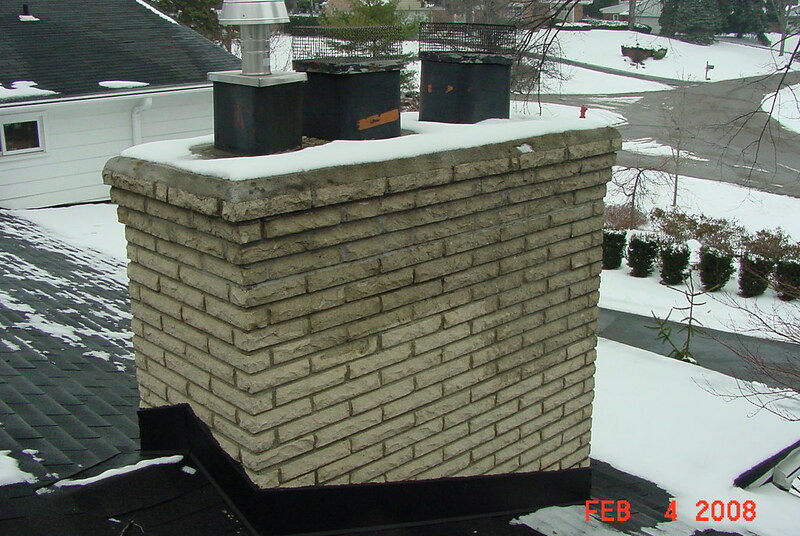 With a new step and counter flashing along the roofline, all new brick and a new fiberglass reinforced slope wash collar...It hasn't leaked since! 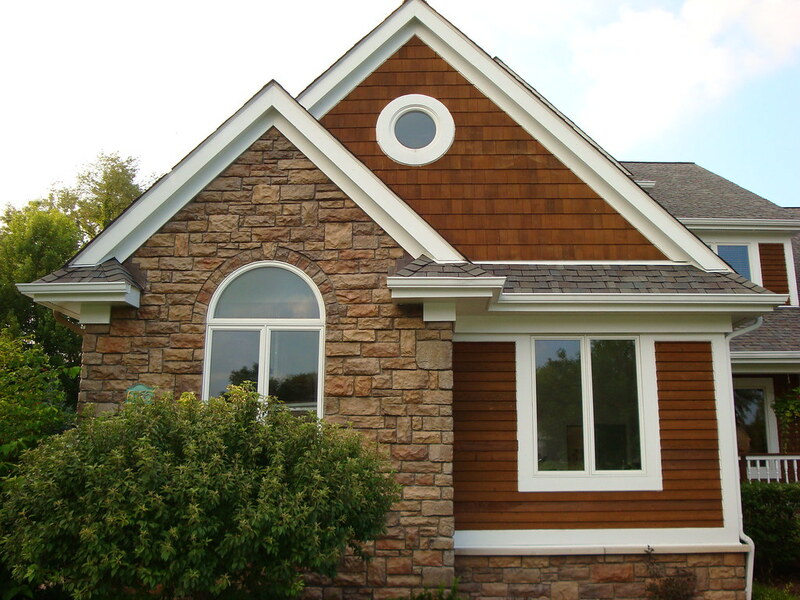 New Vinyl siding, roof, cultured stone. 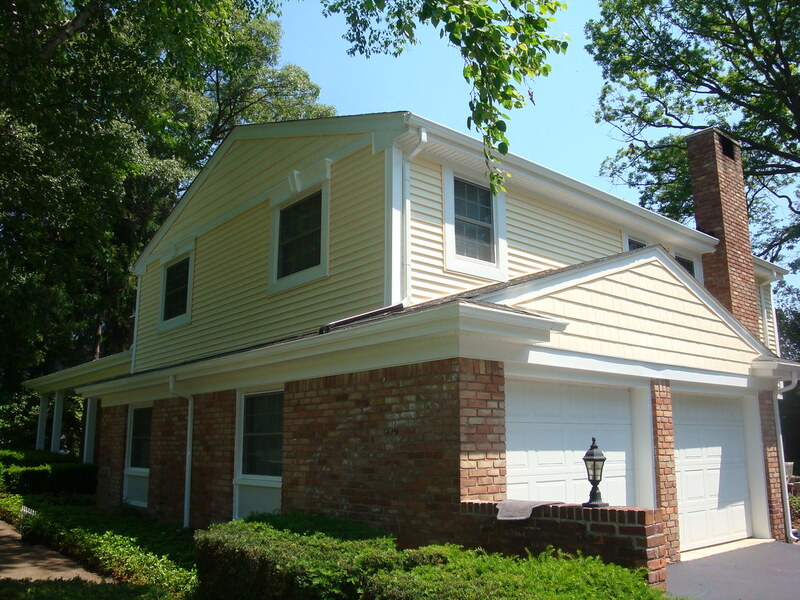 Vinyl siding comes in a variety of styles, shapes and colors to enhance any architectural style. 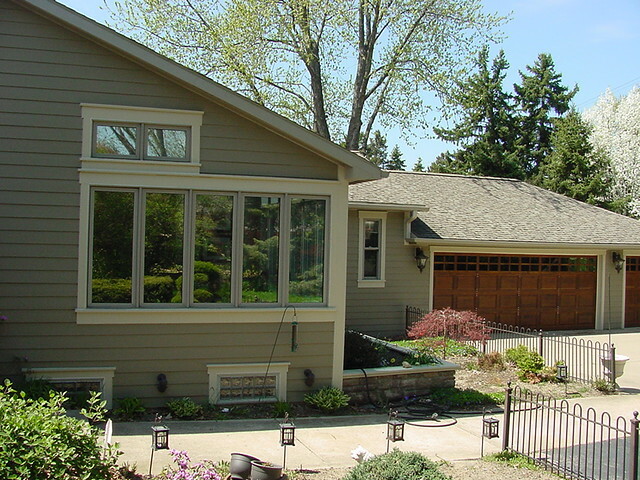 It is an affordable way to make your home “maintenance free” without breaking the bank. 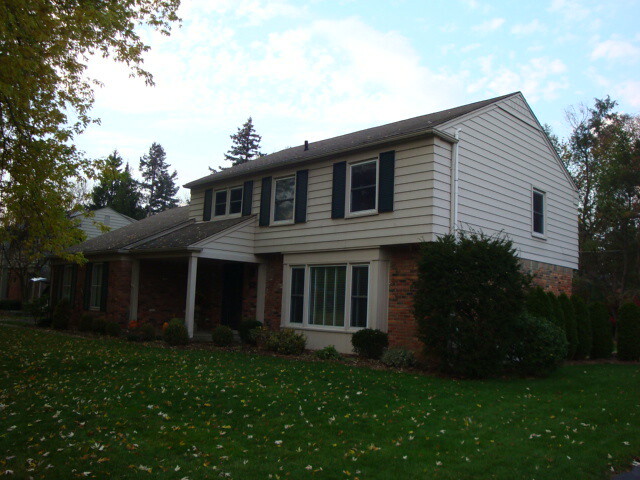 A little different look from this angle with all new siding, trim and shutters. 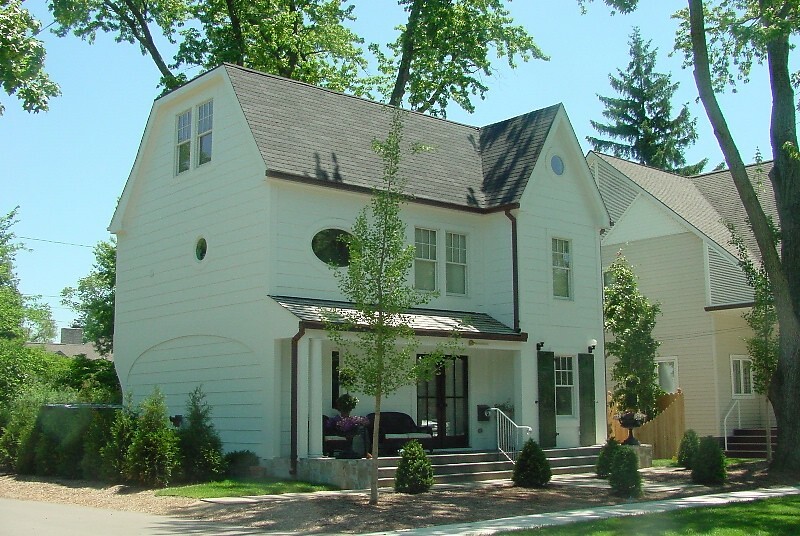 This house turned out great! 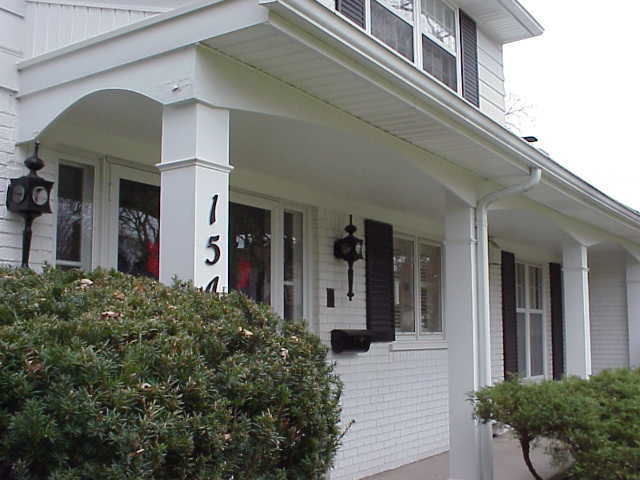 Notice the new columns and the detail of the wider vinyl corner posts, it really helps outline this house and make it stand out from the rest on the street! 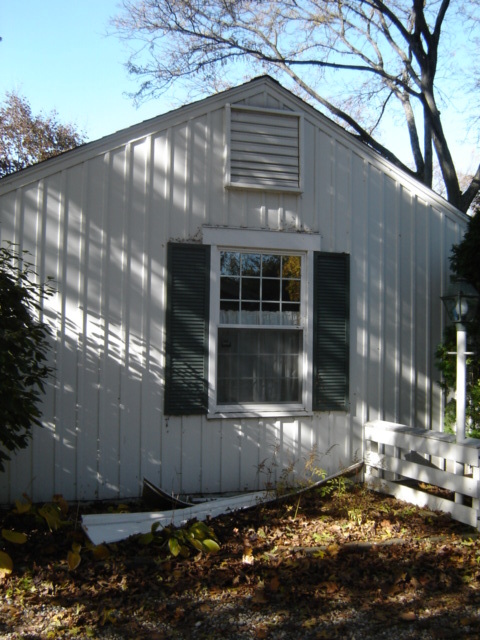 1950's Aluminum siding..looking tired and old. 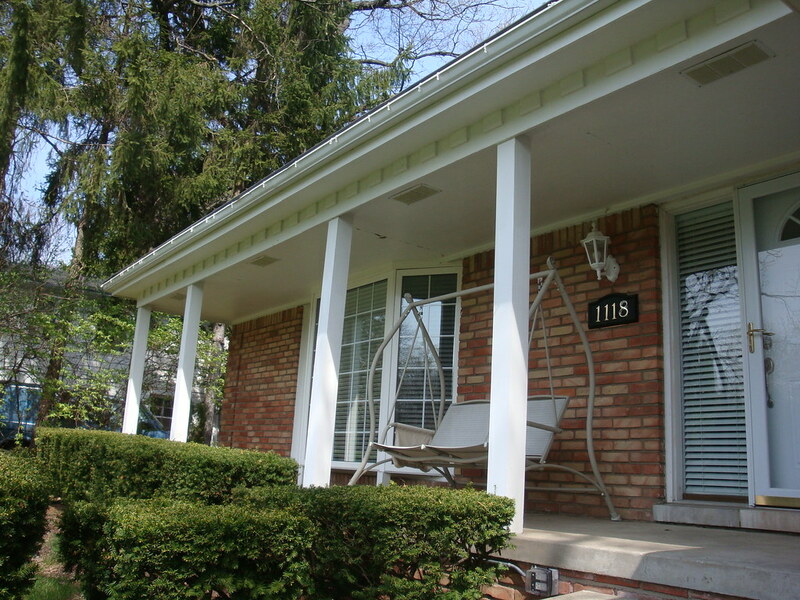 Old aluminum siding and no grand entrance. 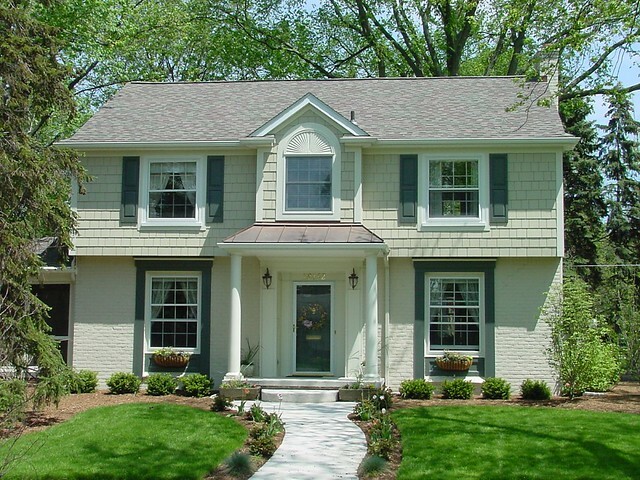 The finished product with a new front porch design incorporated into the mix. 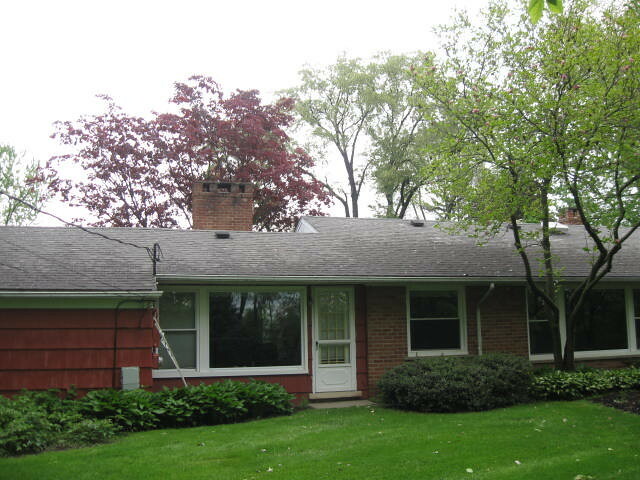 We also added a new Certainteed Independence Green roof. 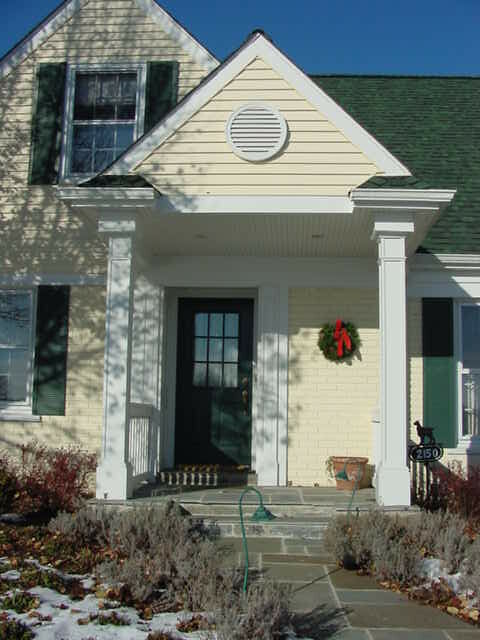 This is a new porch we constructed on the front of this Birmingham residence across from Birmingham CC on Northlawn. 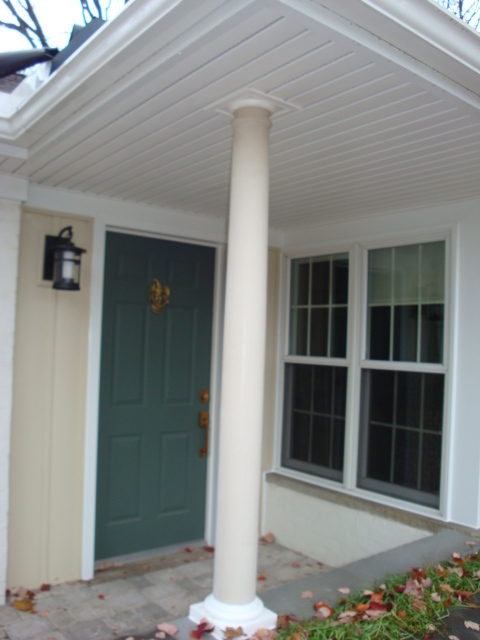 New decorative support column with invisivent vinyl soffit and aluminum trim. 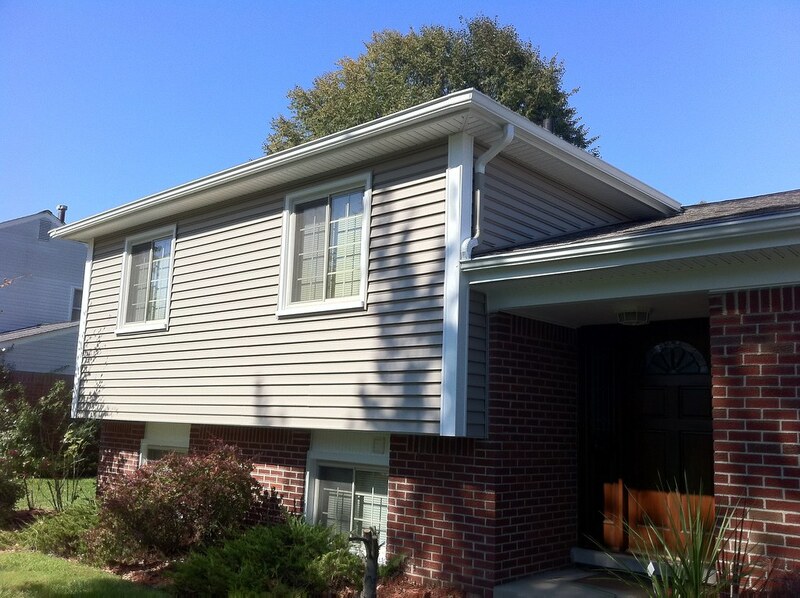 New Certainteed Board & Batten Vinyl Siding with vinly soffit and aluminum trim at the overhang. 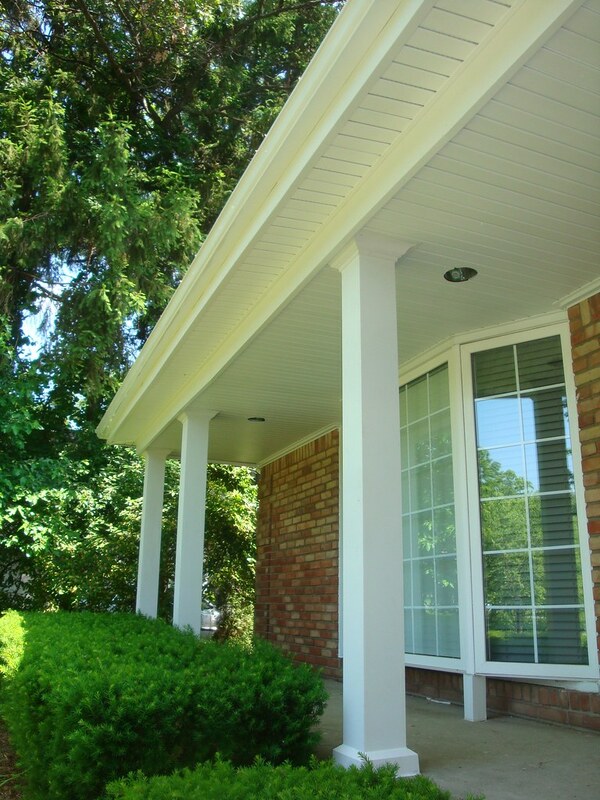 This was a tired old wood soffit that couldn't hold paint, we added a few recessed lights and change the support posts out to decorative columns. 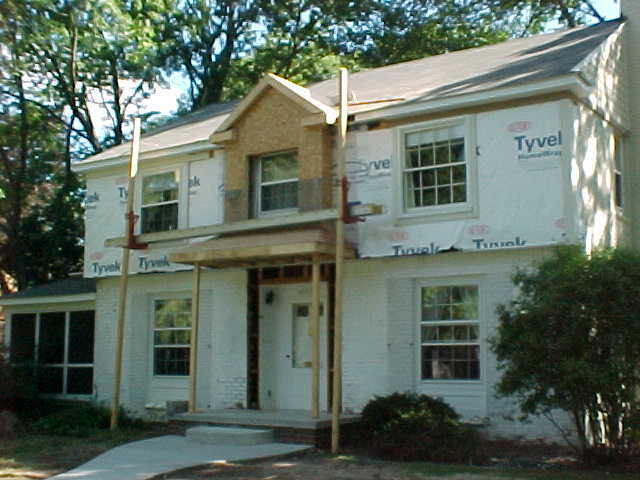 This is the dreaded before photo. 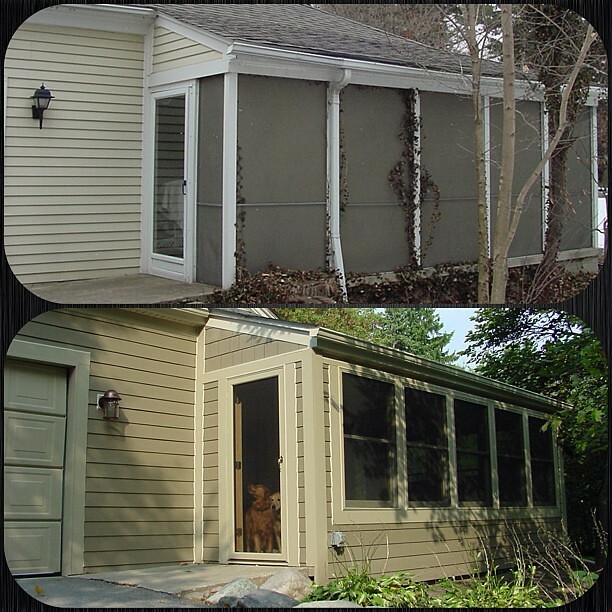 Wow..what a difference a little vinyl siding does with some creative design elements! 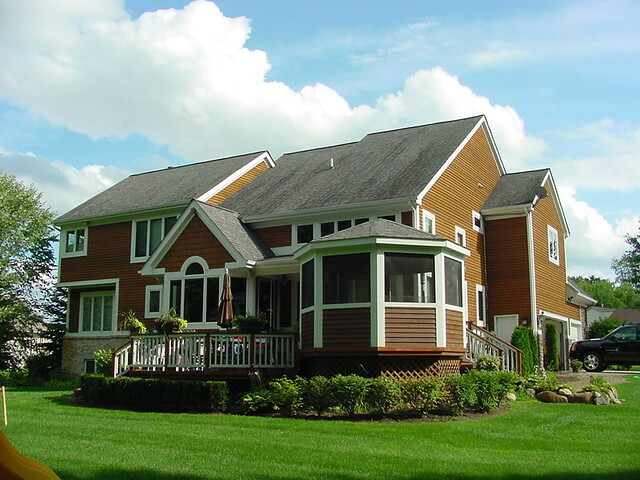 Intelligently designed to last up to 50 years, James Hardie provides durable, beautiful siding options for your home. 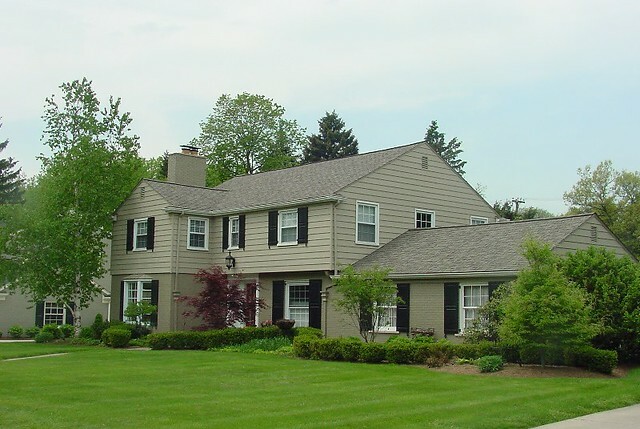 All of our products come with a 15 year warranty on the pre-painted finish and all of our crews have been trained by James Hardie to install the product we offer. 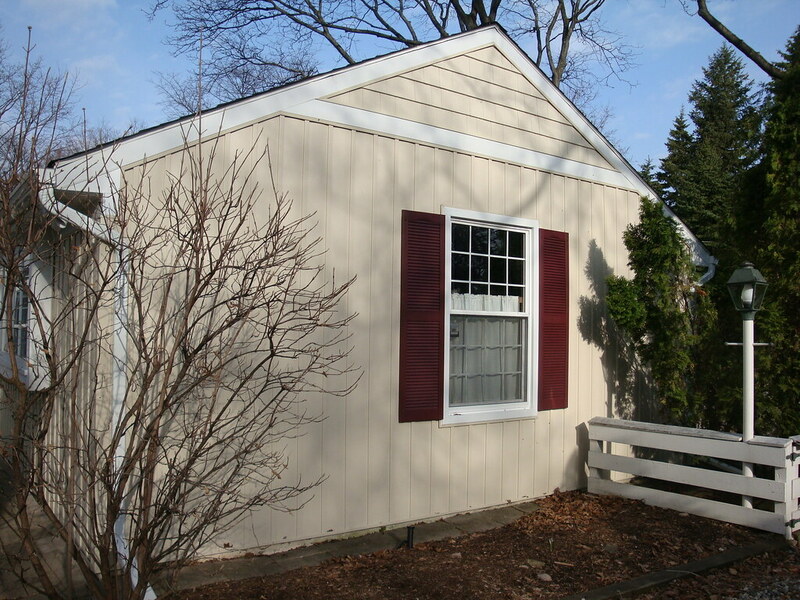 Tired 30 year old wood siding that just wouldn't hold paint. 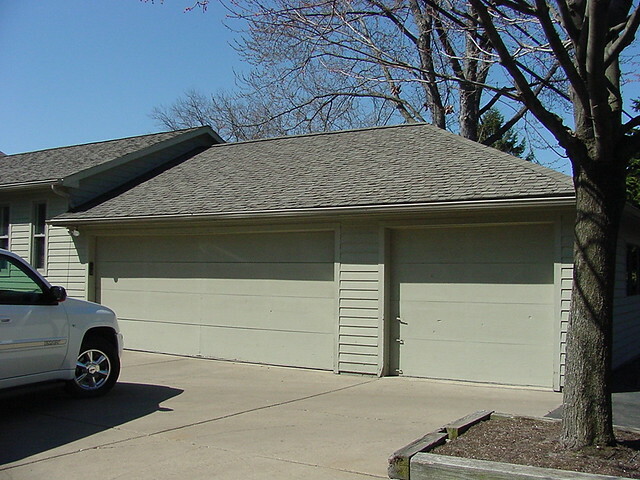 Nice shot of the new garage doors in the back drop. 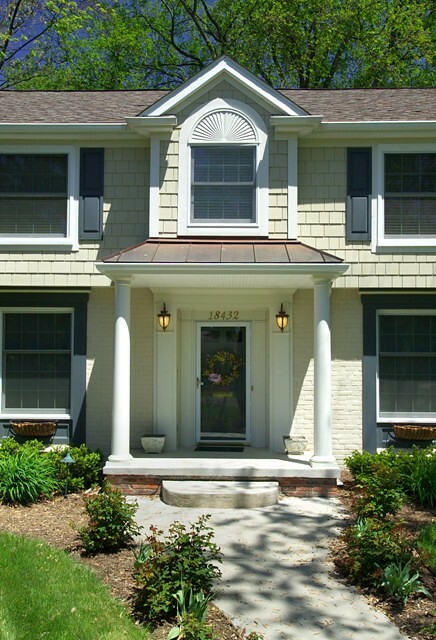 Notice the way the windows were trimmed out using a cottage style trim detail. 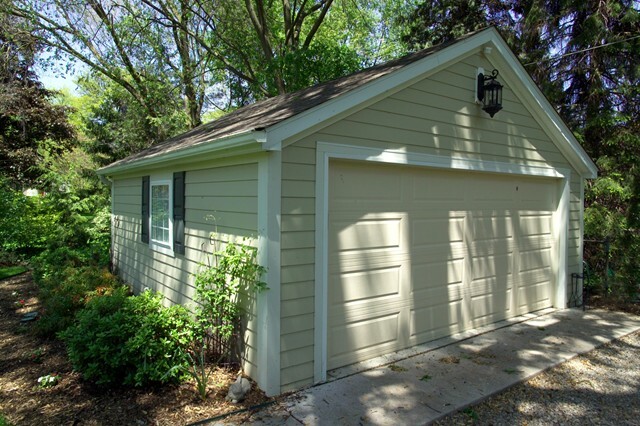 These old garage doors needed help and an updated look. 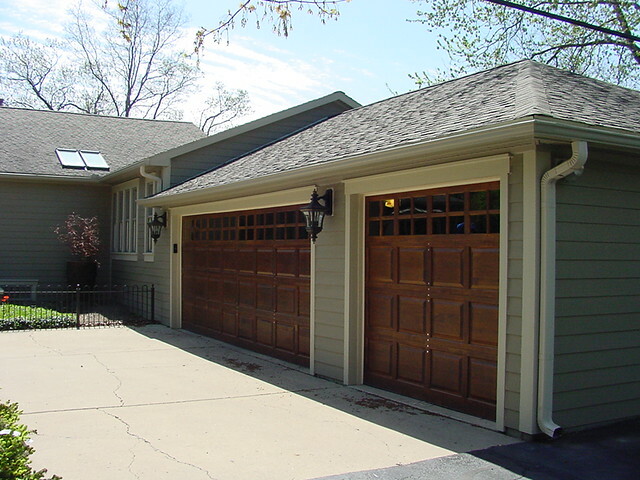 New garage doors,trim,and light fixtures...what a difference the details make. 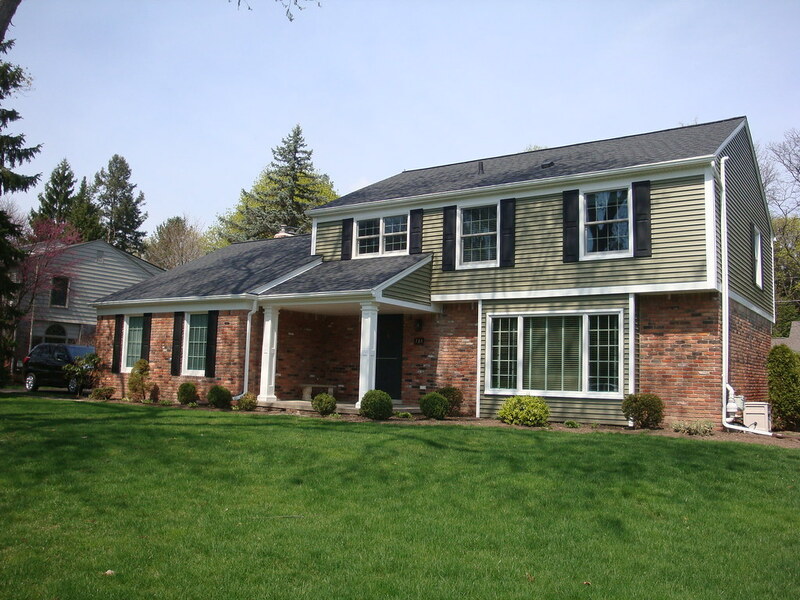 Full view of totally transformed Upper Straits Lake exterior using new James Hardie prefinished siding and trim. 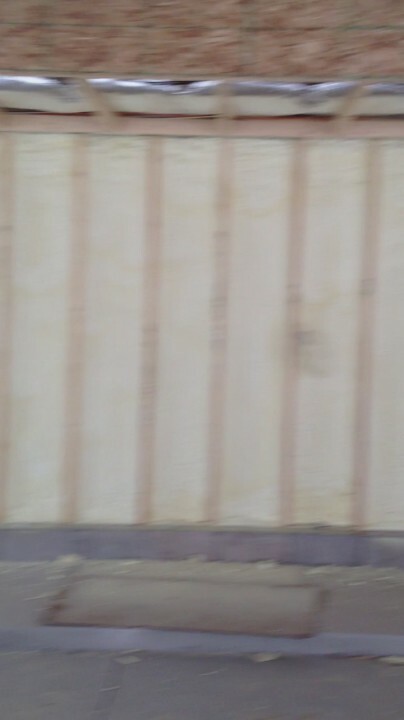 Close up of the newly sided wall. 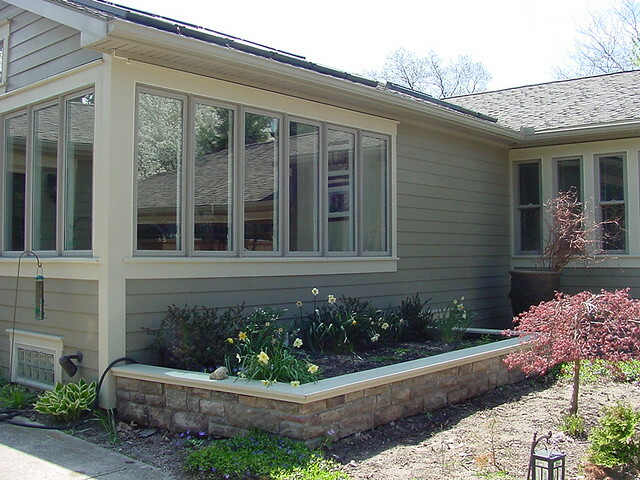 We trimmed out the windows with a 1x6 to add some detail. 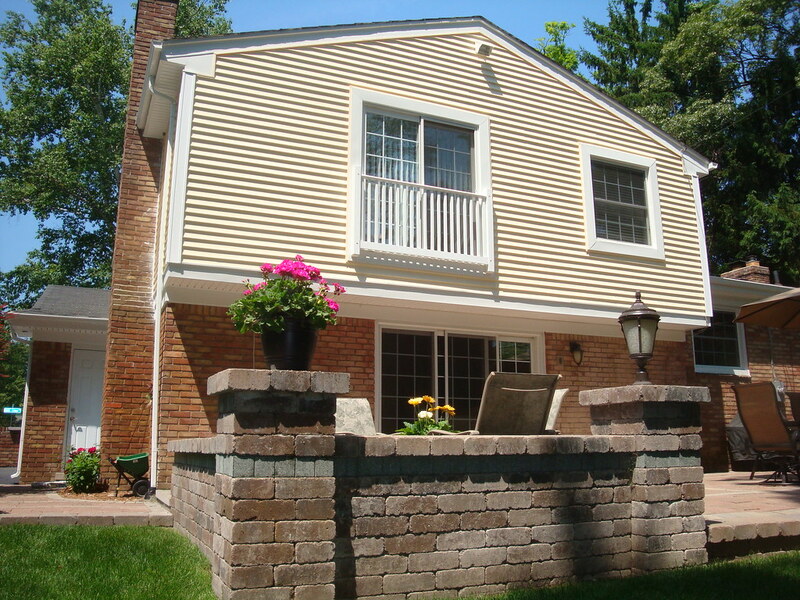 Notice the landscape retaining wall was changed out from rail road ties to a nice cultured stone to compliment the siding. 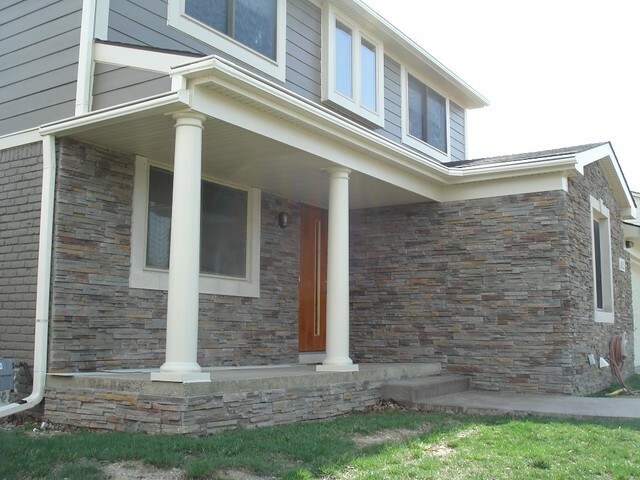 What a difference some cultured stone and new columns make here. 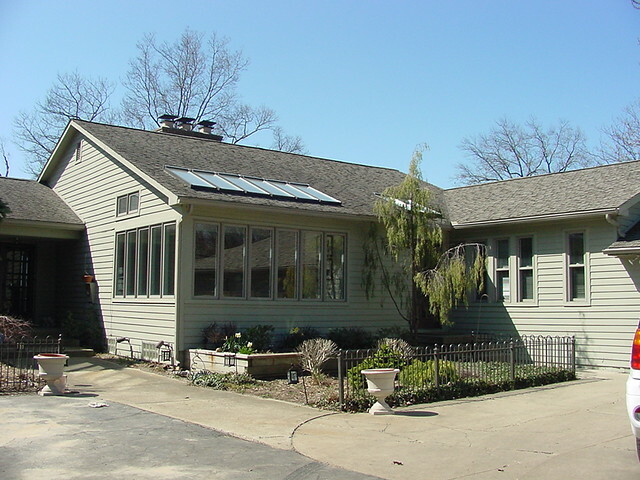 This bay widnow was totally replaced with a new Andersen Bay unit and a custom bent copper standing seam roof. 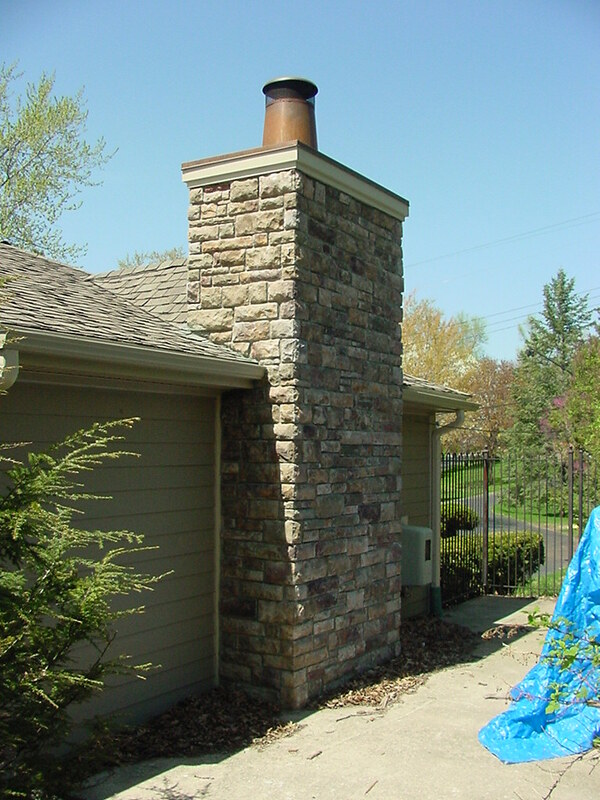 We then replaced the cap on the chimney behind it to match. 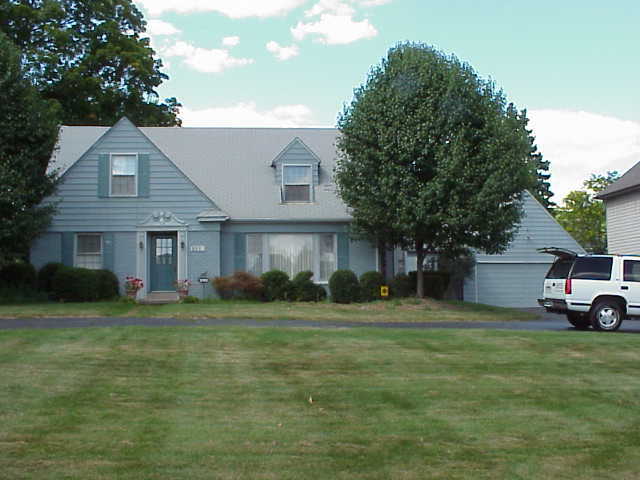 This house still looks great after 11 years. 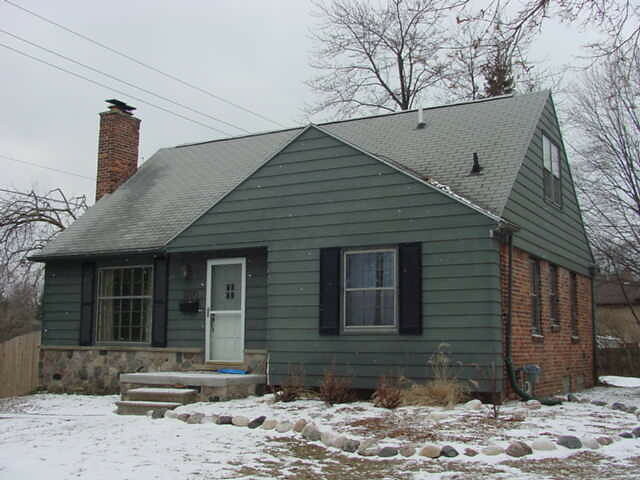 This is the before photos without the front porch and without the new windows and siding. 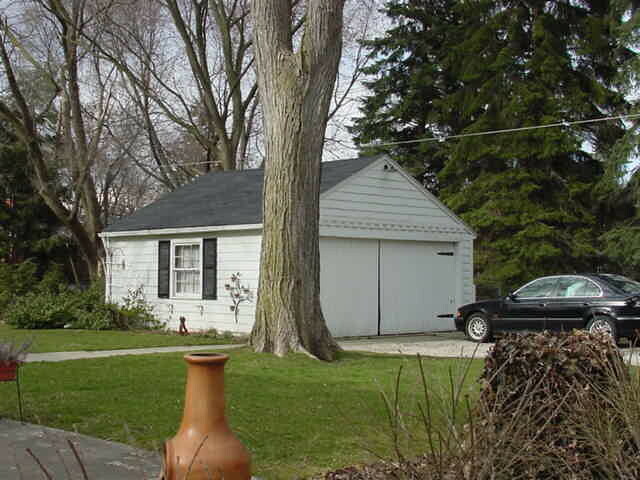 This is the original garage before exterior renovation. 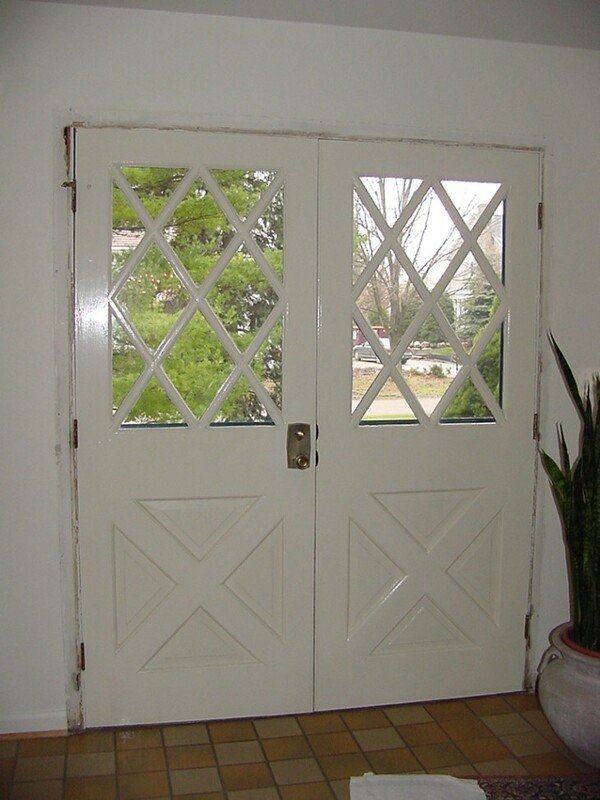 The original 1950's aluminum sided front. 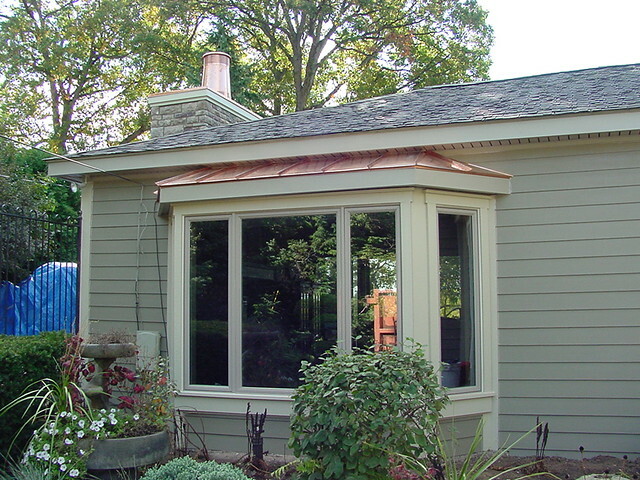 A great shot of the new front porch we added on complete with copper roof and new walkway. 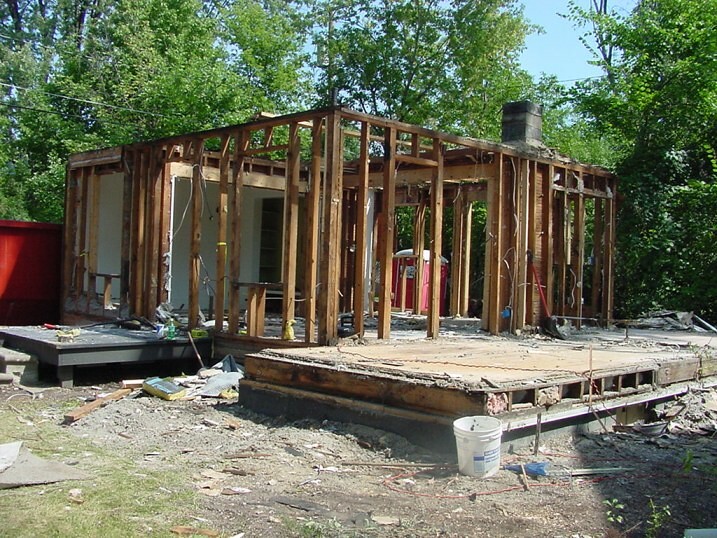 This is after we removed about 95% of the home. 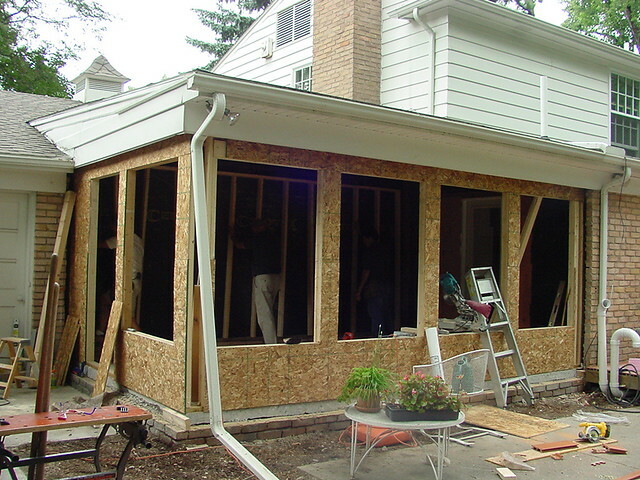 If you leave walls standing it is classified as a remodel and not new construction. 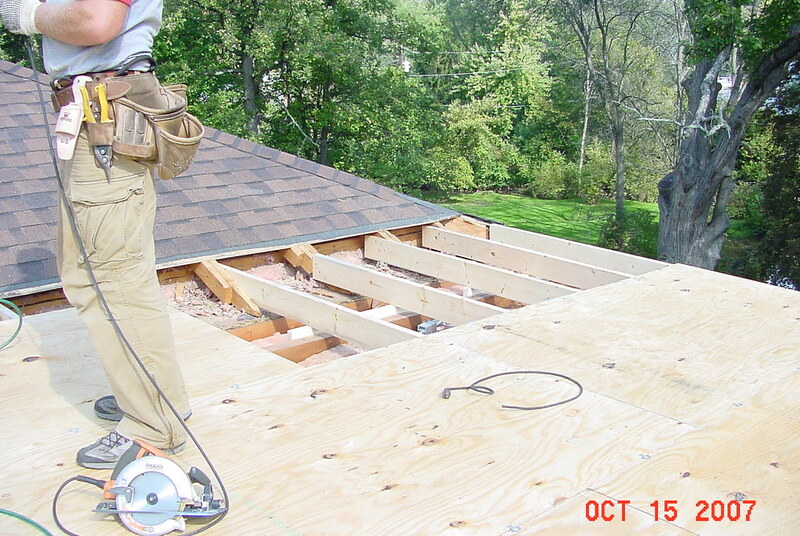 This is the photo taken before we started removing the roof and walls. 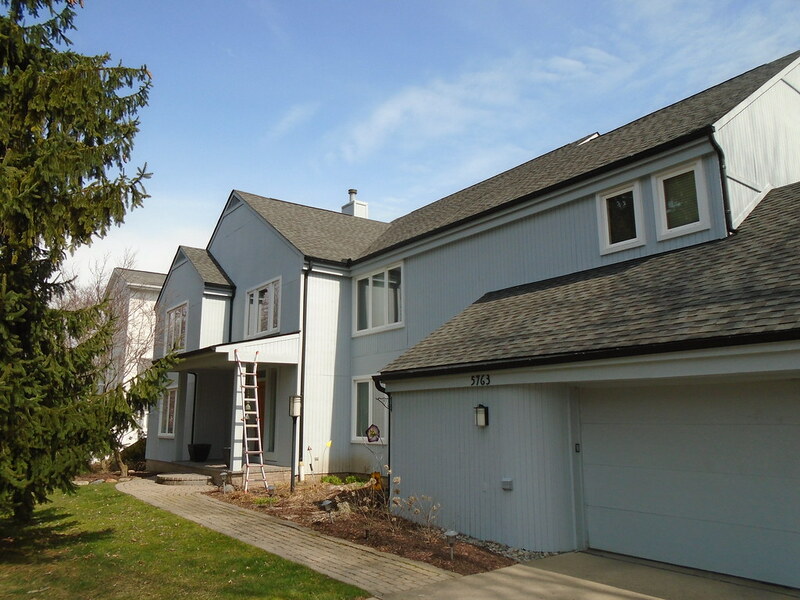 New Weather Shield twin casement with new miratec trim and James Hardie Stucco siding above. 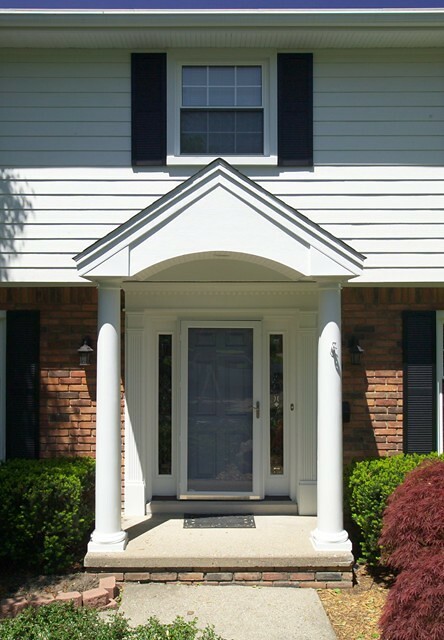 Create the perfect entrance for your home with a new porch or entranceway. 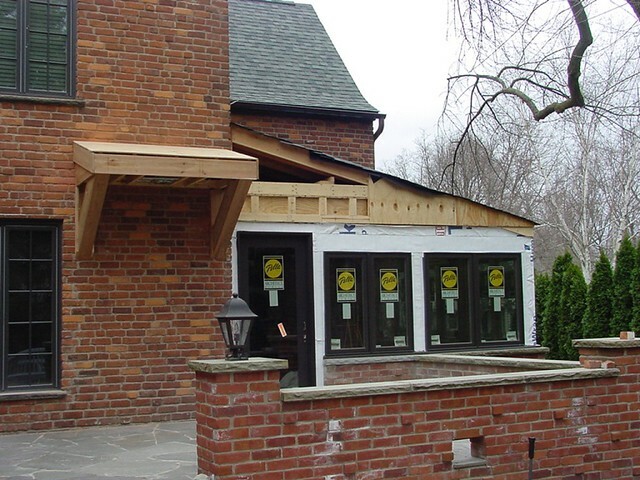 If you can envision it we can build it. 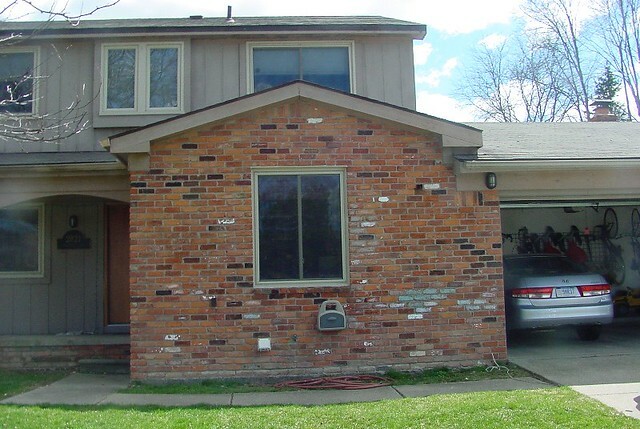 Needed something for the pizza delivery man to stand under while making his delivering. 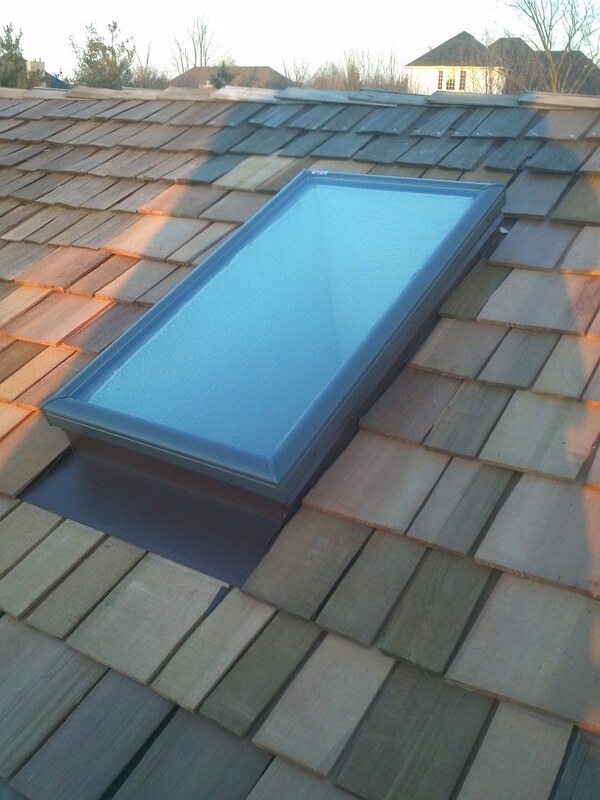 The finished product fitting nicely onto this Royal Oak residence. 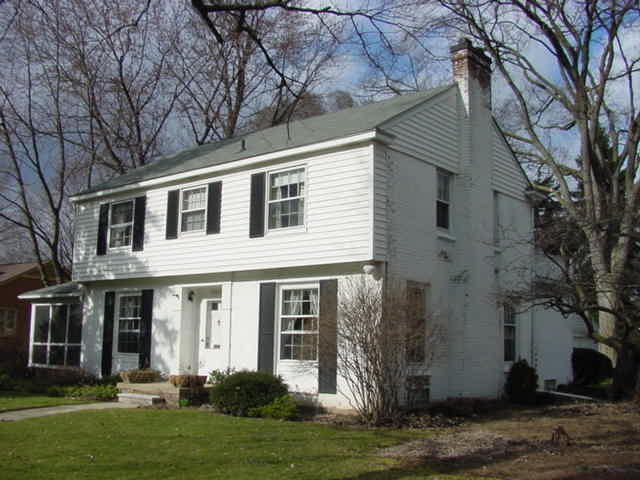 Needs a fresh updated look. 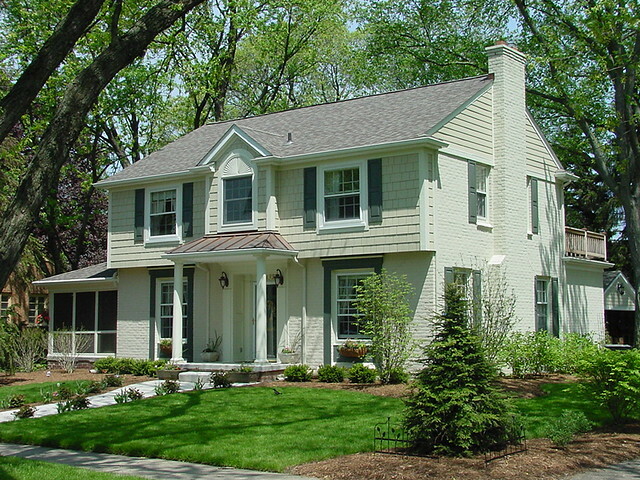 What a transformation from old to new. 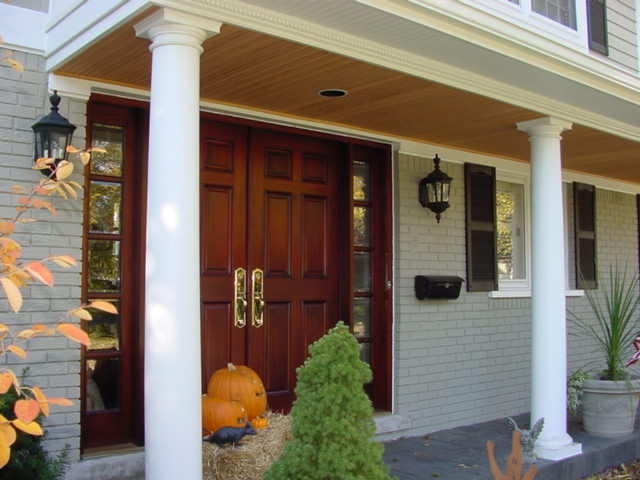 We changed out the columns, installed a pine bead board soffit with recessed lighting, a new front door, and stamped concrete walkway. 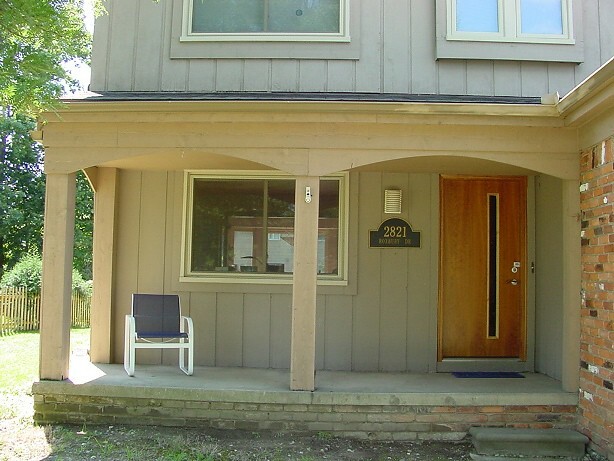 It's just a small overhang here. 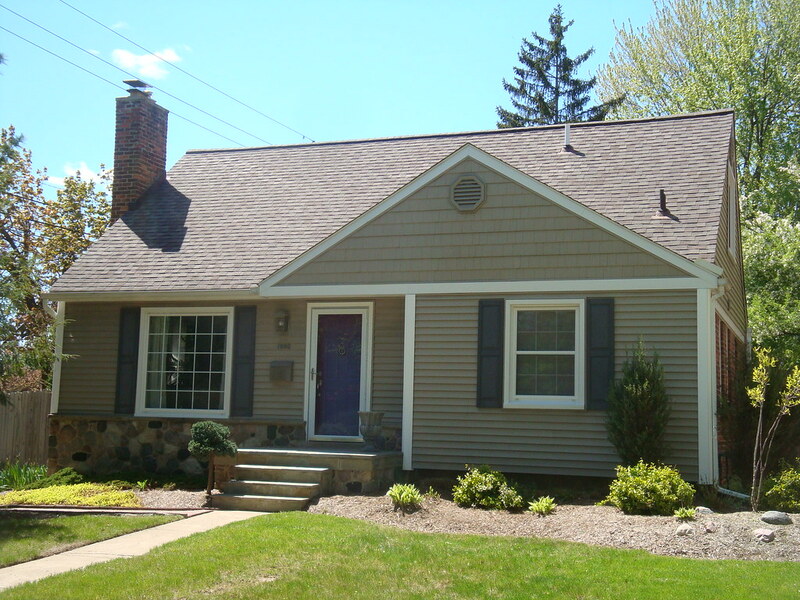 The finished product all trimmed out to match the original style of the home. 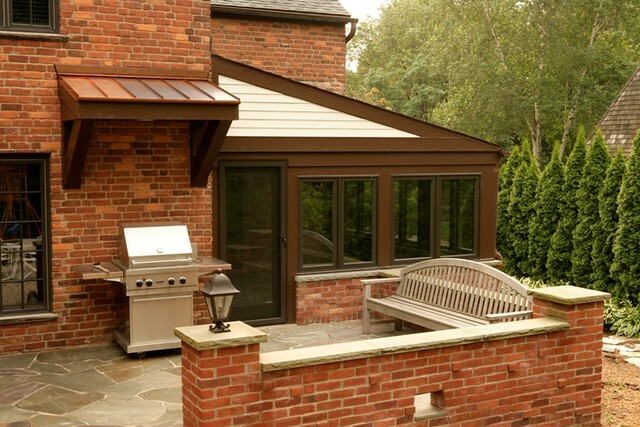 We even build a little copper roof over the grill to match. 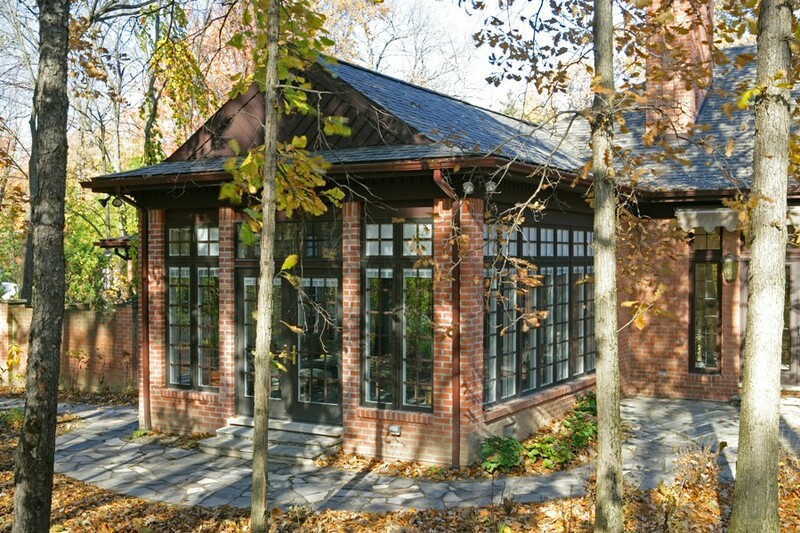 This is a view from the other side showing the skylights that were added and the 1/2 brick wall to match the original brick from the early 1900's. 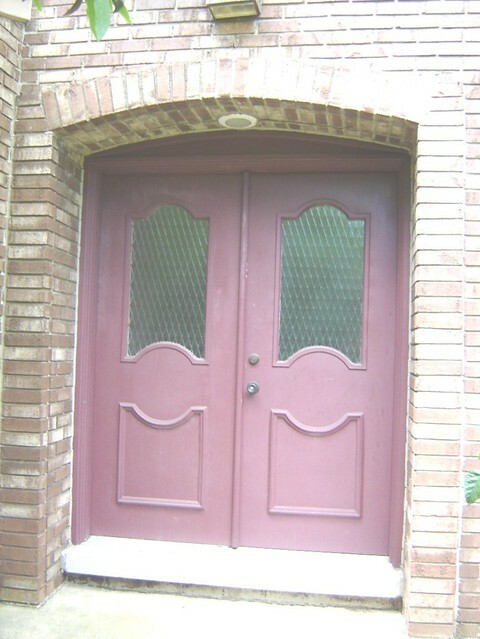 This is the finished shot with heat, brick knee wall, and Andersen windows and door. 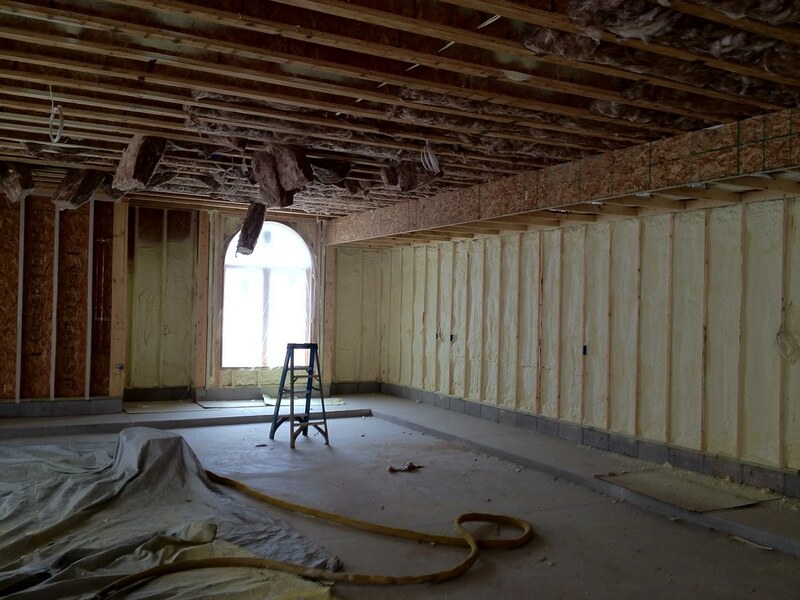 This room was usable about 4 months out of the year. 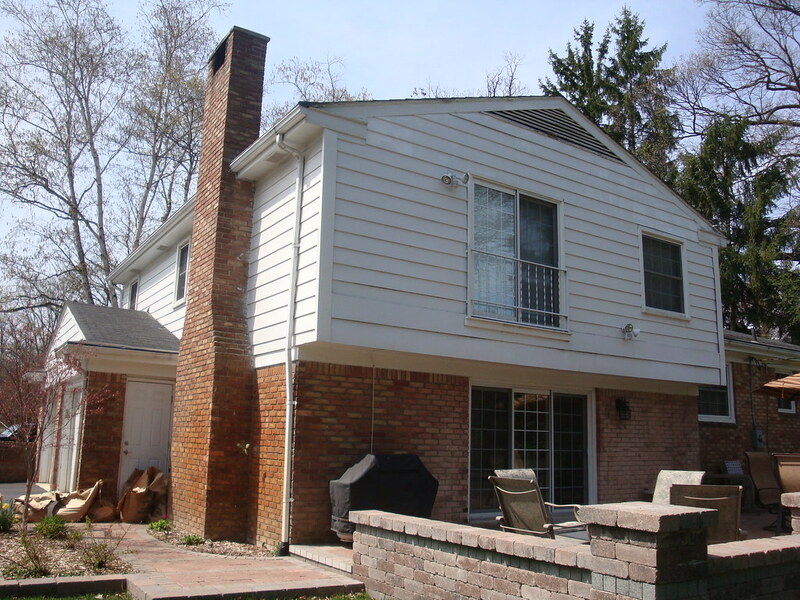 Our intent was to finished the exterior so it looks like is was always part of the house and not added on. 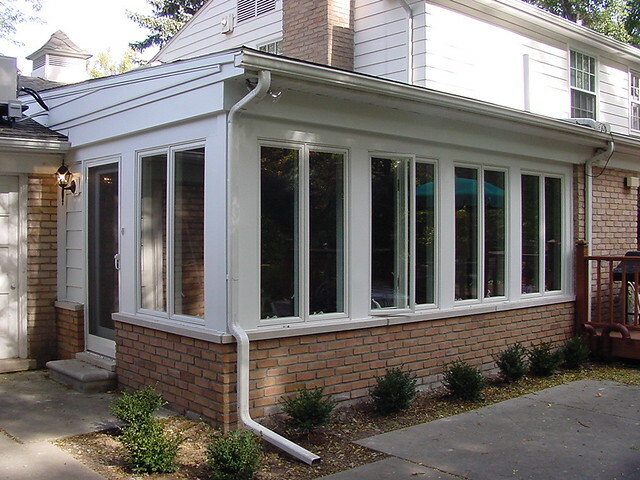 From screen room to sunroom it looks much better than a Temo or Champion style Sunroom porduct. 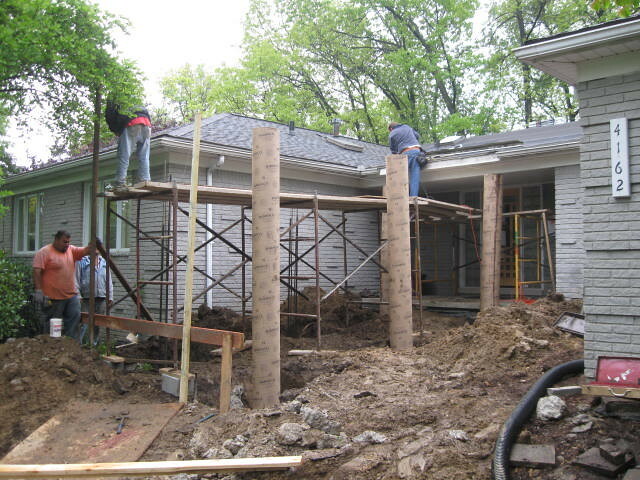 Torn out and setting the concrete decorative support pillars. 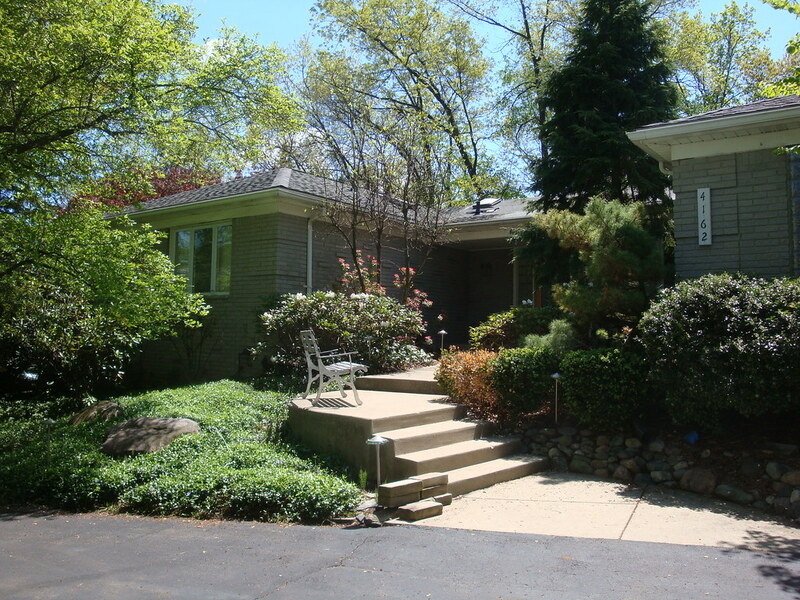 Finished with new retaining wall and exposed aggregate walkway and steps. 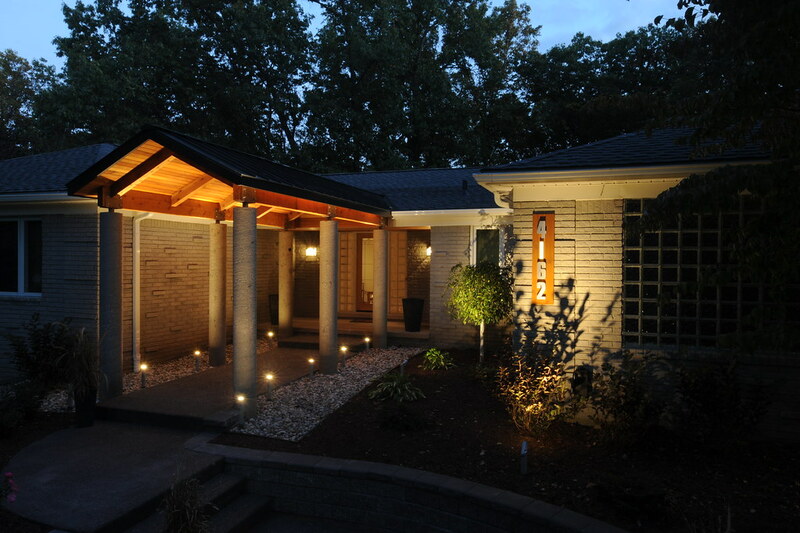 A nice dusk photo of the new porch with landscape lighting a glow. 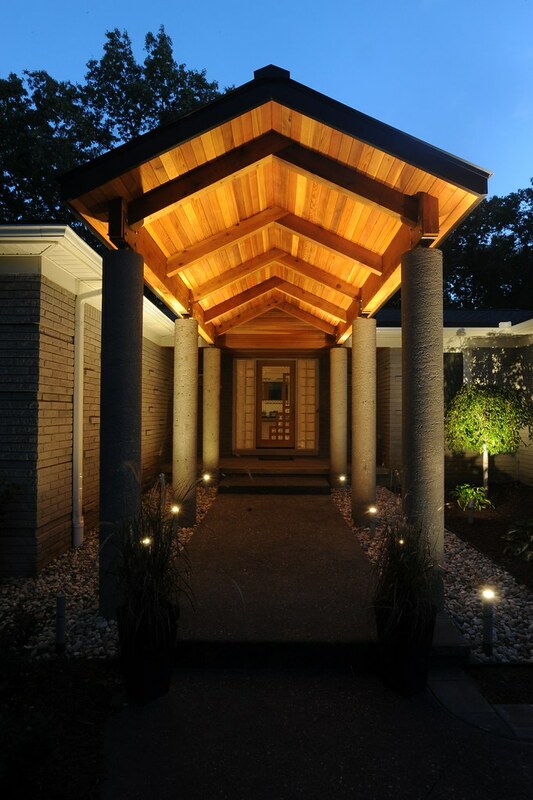 A great shot of the newly constructed porch, ceiling and walkway lighting. 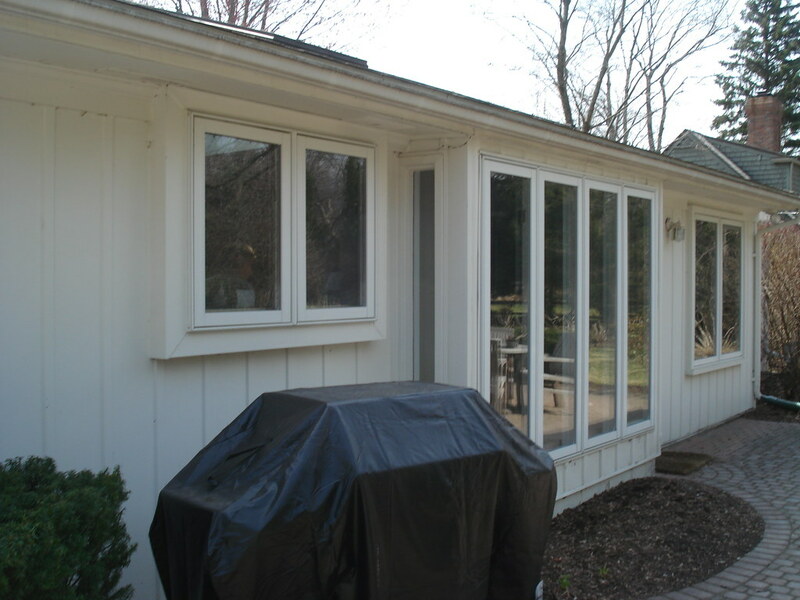 Offering only the highest quality wood, fiberglass and vinyl products, we have a large range of window options to complement and fit your budget. 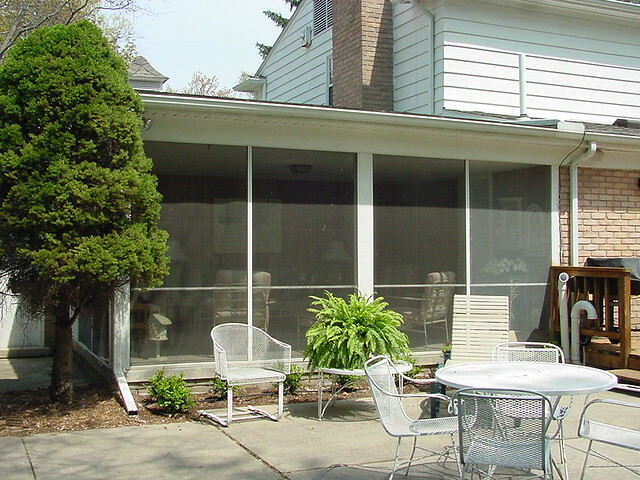 Motorized blinds in all upper sashes of this room. 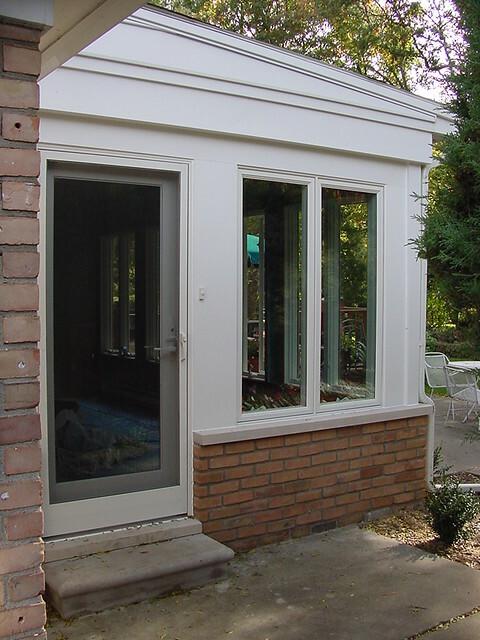 This unit was cut into the brick to enlarge the opening and add the sidelight. 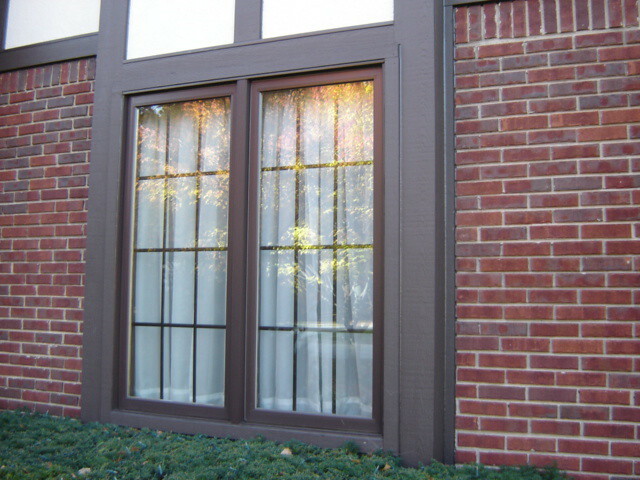 A newly installed picture window with 2 Double Hung flanker units. 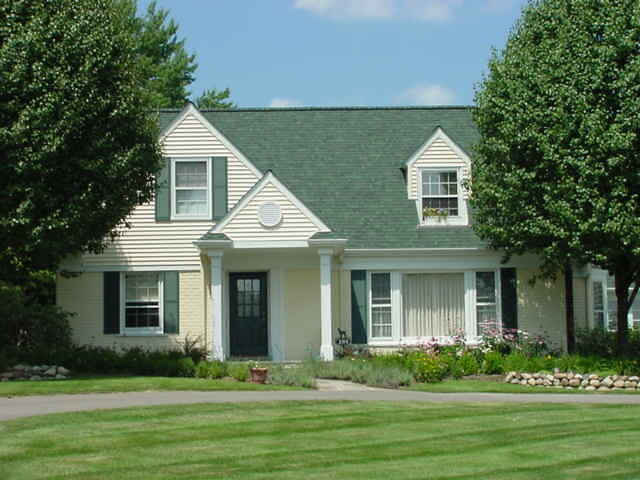 A house’s details can have a big impact on its appearance. 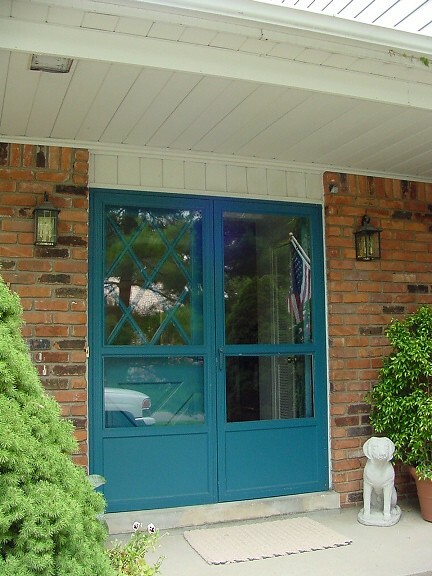 Find the perfect door style to match your home’s exterior. 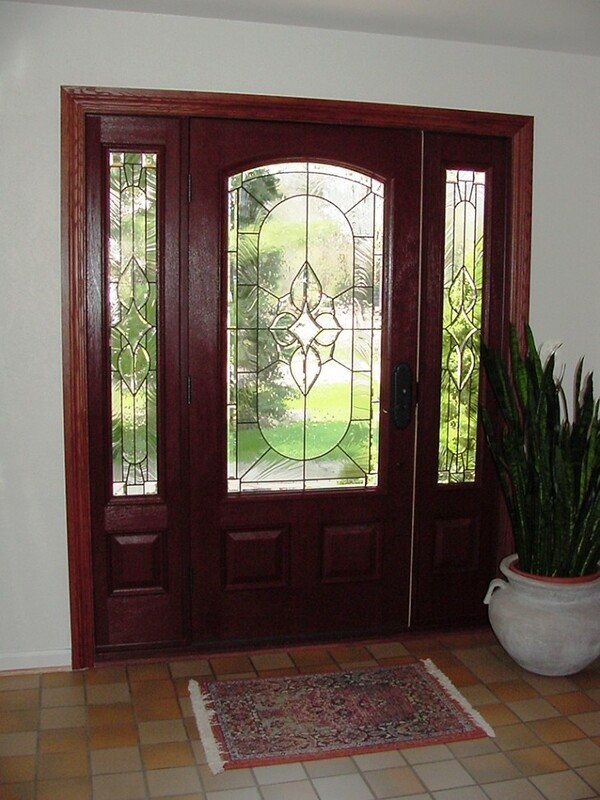 Updated Fiberlglass Therma Tru Classic Craft Mahogany prefinished door that will not rot or peel. 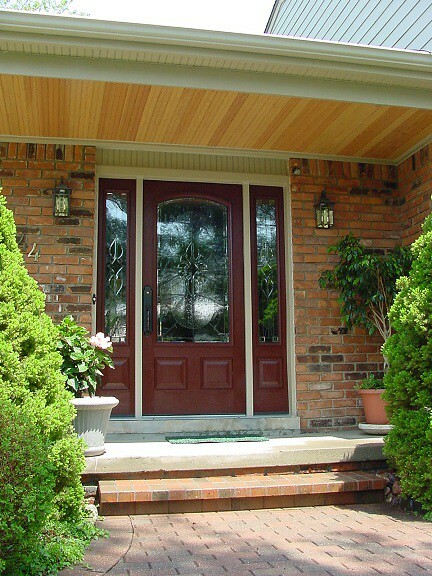 Finished view with new pine beaded board soffit & Classic Craft Mahogany door. 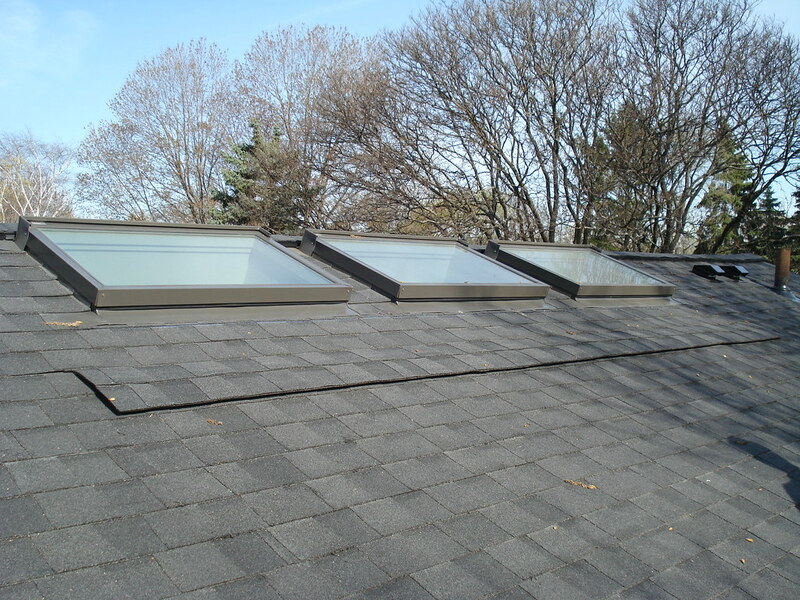 Installing and replacing skylights is not something every contractor is qualified to do. 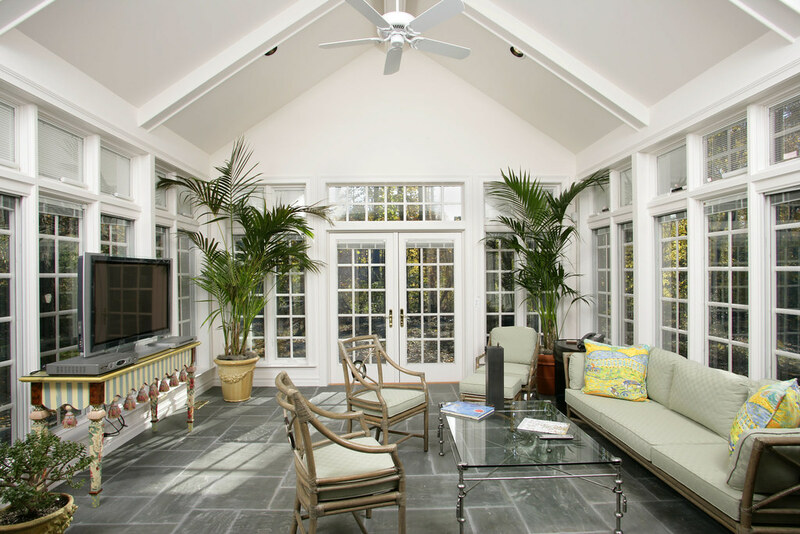 We are a Velux certified installation contractor and we have installed thousands of units over the past 25 years. 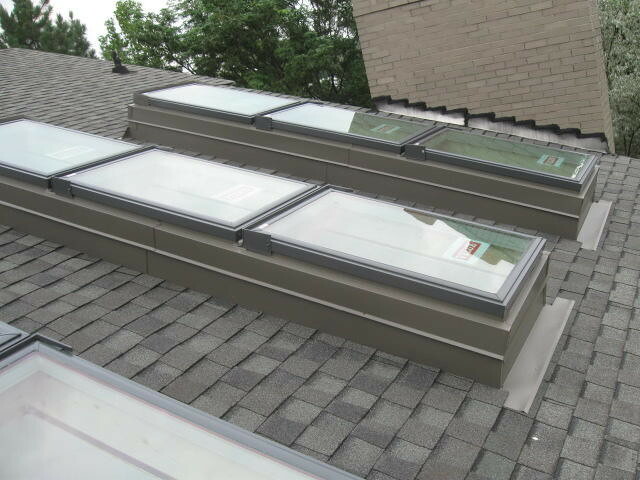 These are 3 Velux units we installed with a new roof job. 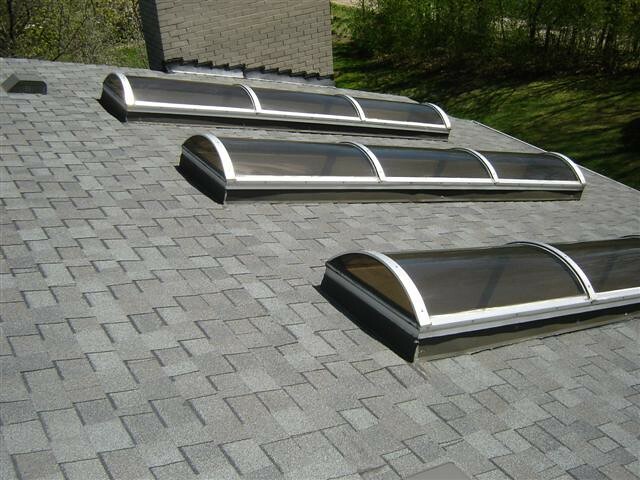 The dreaded and constantly leaking bubble style skylights from the 70's! Wow did these turn out nice! 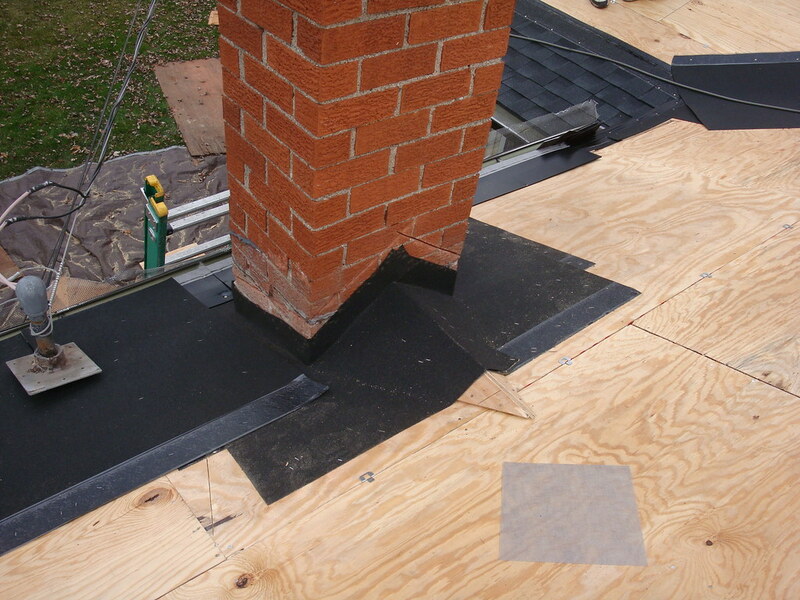 We framed up custom sized units, then created our own step and counter flashings to match the roof. 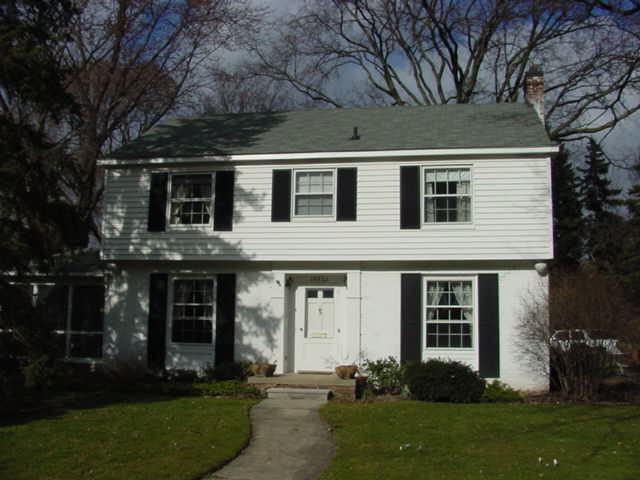 No leaks here and the look fantastic and updated. 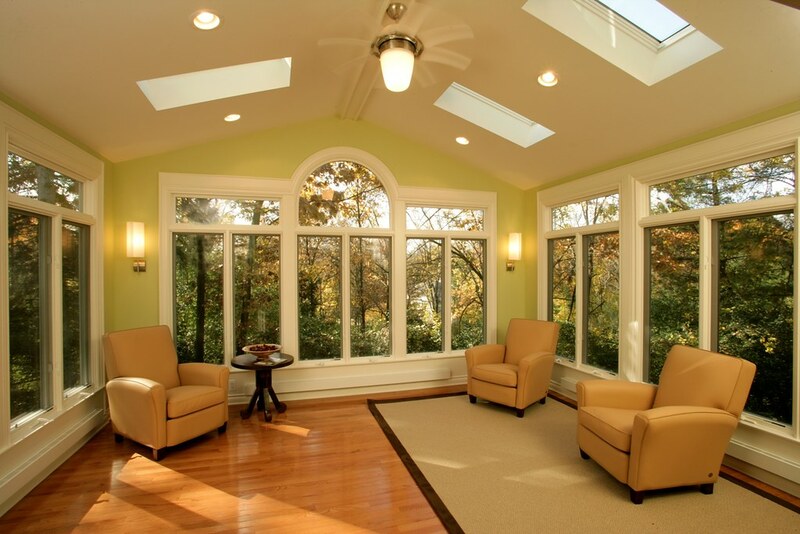 No more bubble style skylights! 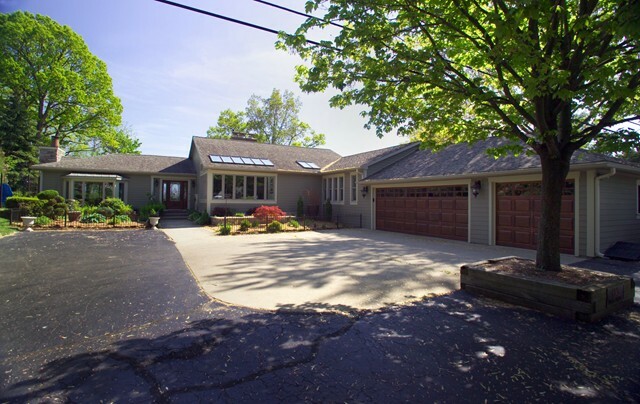 Very Dated look with these old bubble style units on this Bloomfield Hills home somewhere in Wabeek. 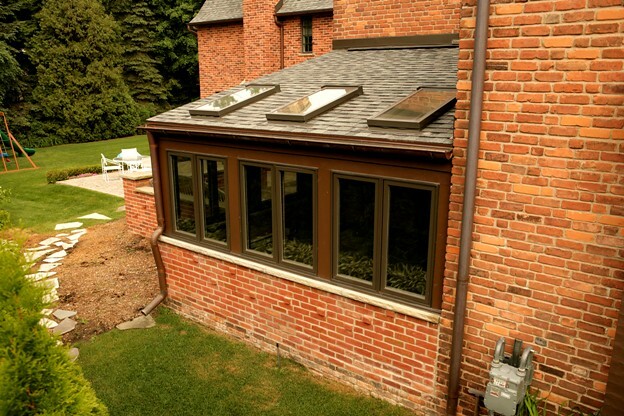 We added this Velux Sun tunnel skylight on this West Bloomfield home. So much light in the hallway now! 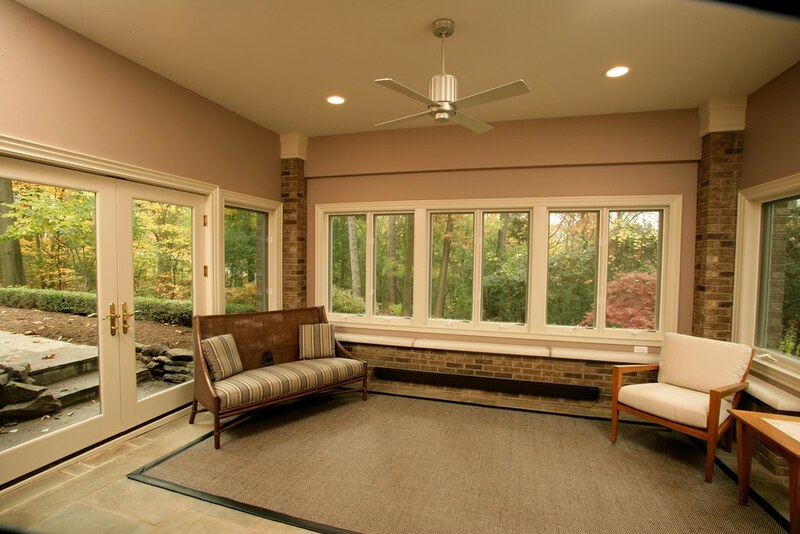 Proper insulation means more energy efficiency. 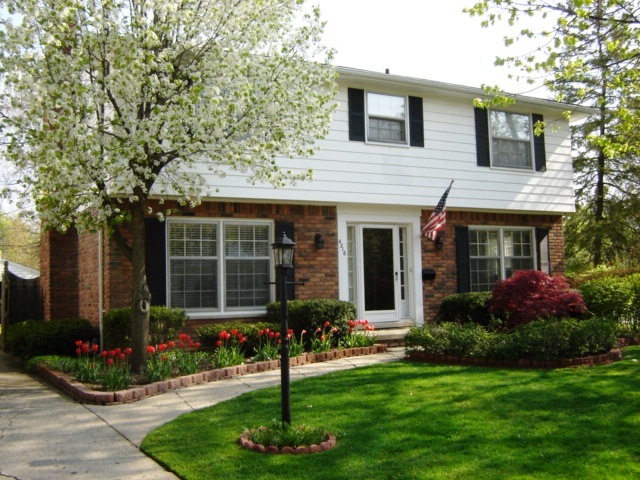 Decrease your home heating and cooling costs, by calling the experts. 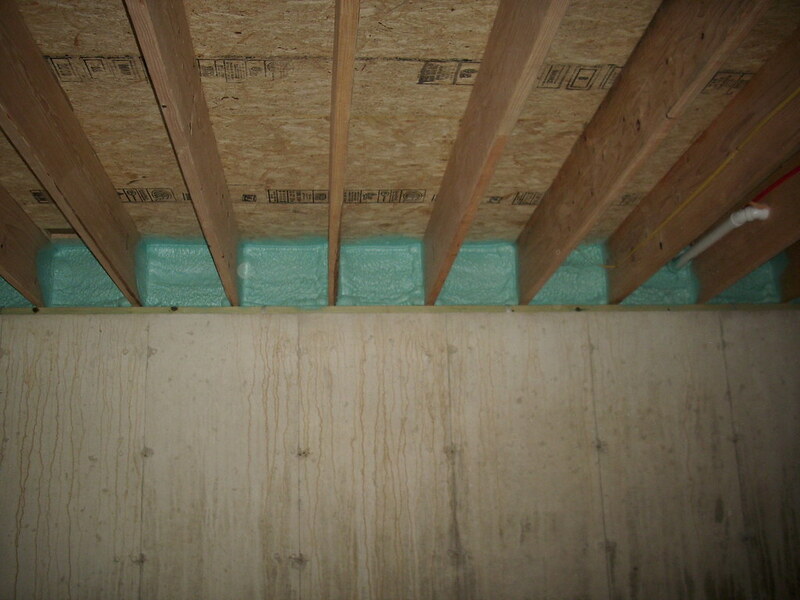 We use fiberglass, cellulose as well as open and closed cell spray foams for maximum efficiency. 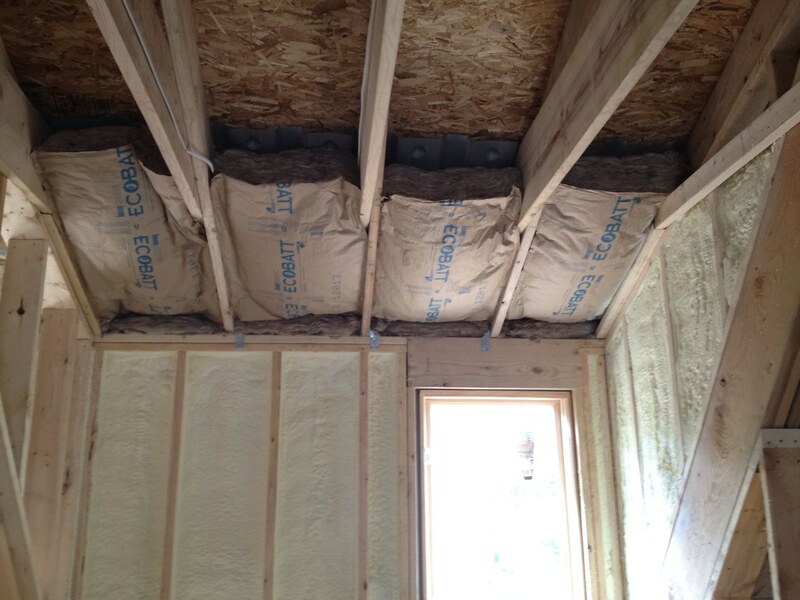 This is by far the best insulation for a true cathedral ceiling. 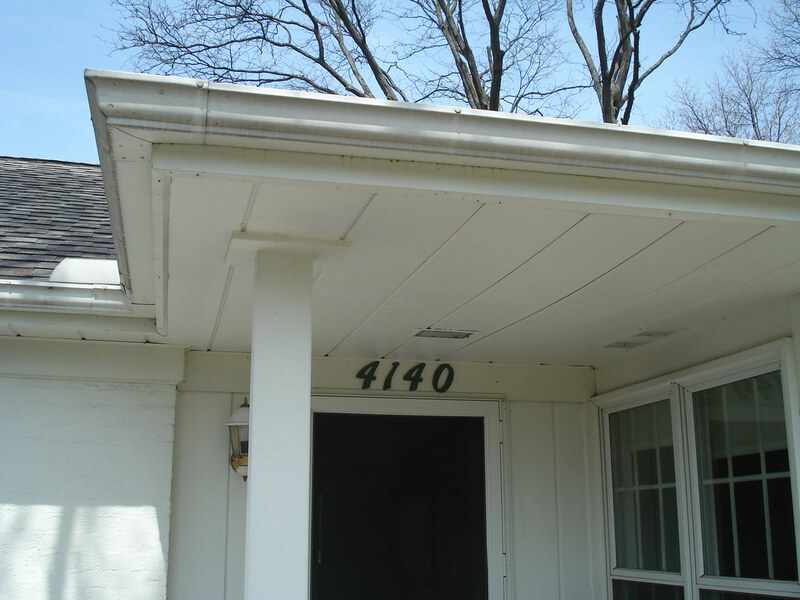 With closed cell foam, there is no need to ventilate the soffits or roof. 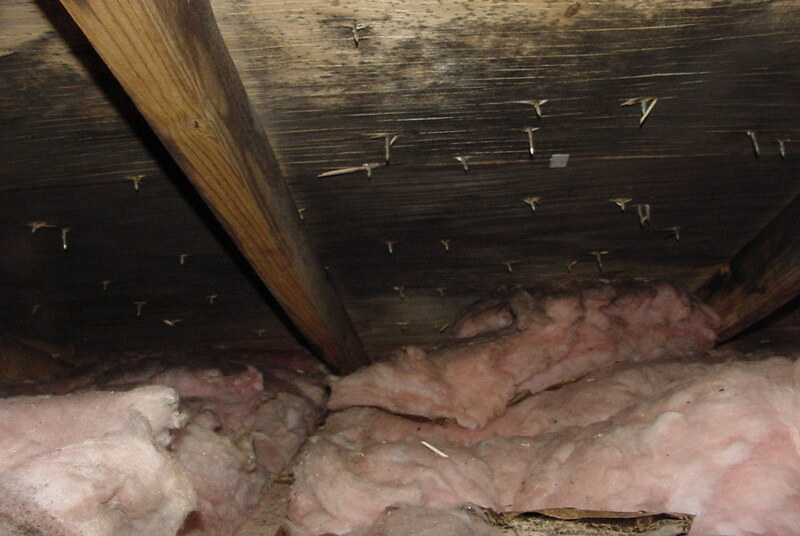 There will never be condensation, mold, or ice dams in this attic. 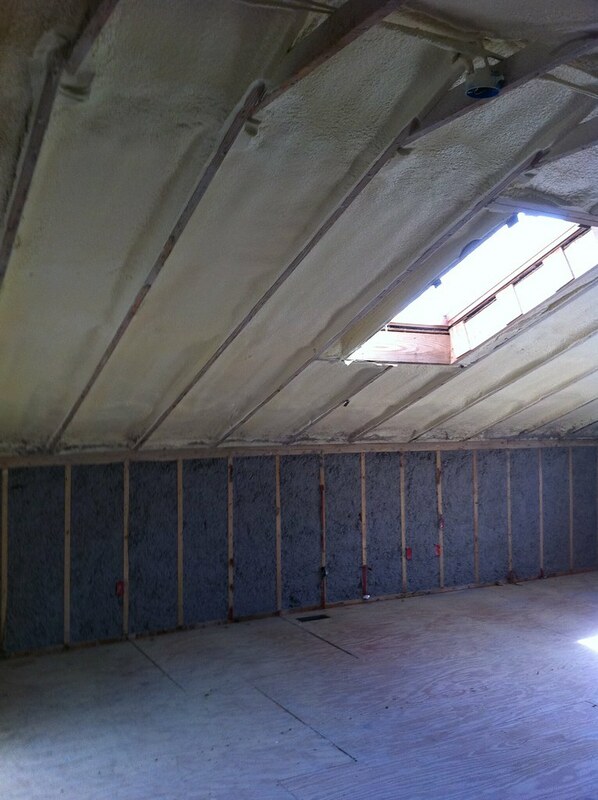 Closed cell insulation in the cathedral ceiling with cellulose in knee walls. 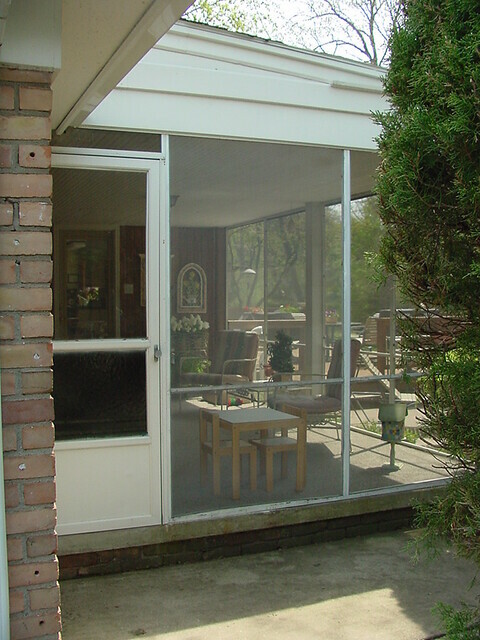 The cellulose was used as a cost saving measure and chosen by our client. 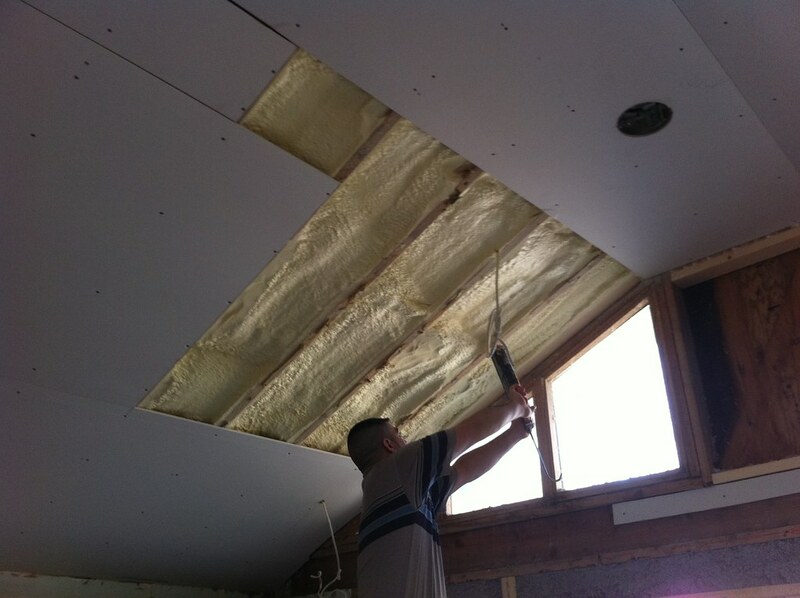 We always recommend foam in a walls & ceilings. 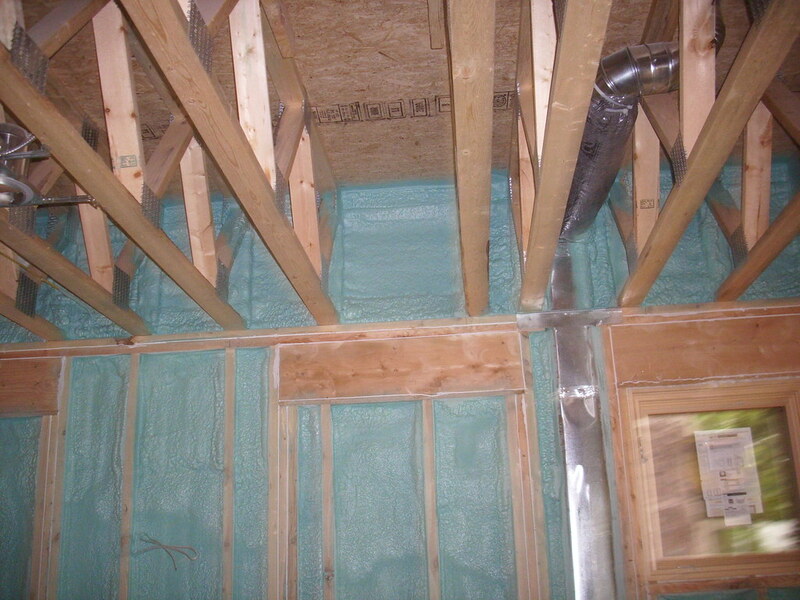 Air tight now with open cell foam. 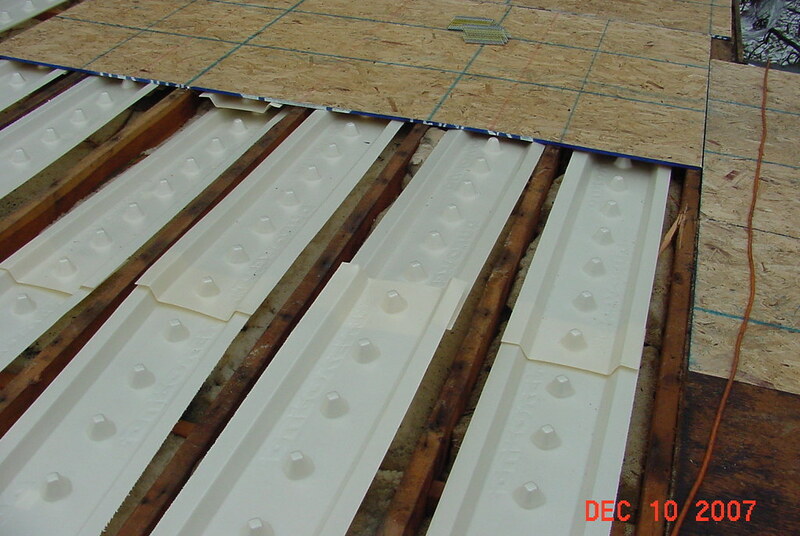 This will stop any thermal bridging affects. 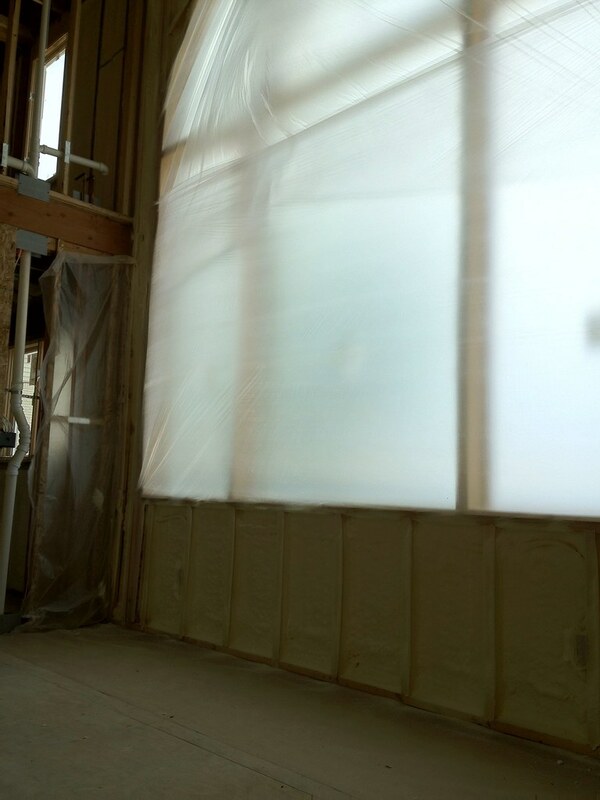 This house is now much more effecient with the bond boards sealed up with open cell foam. 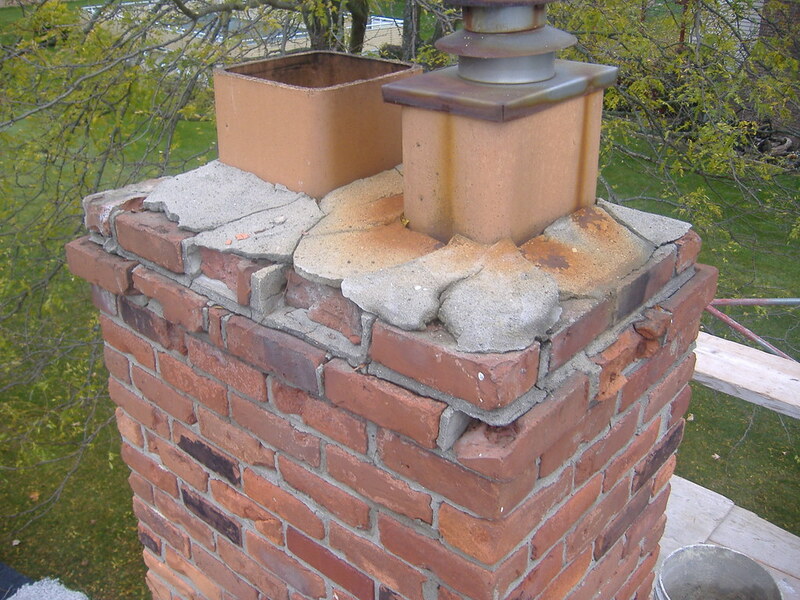 Reduced Thermal bridging here! 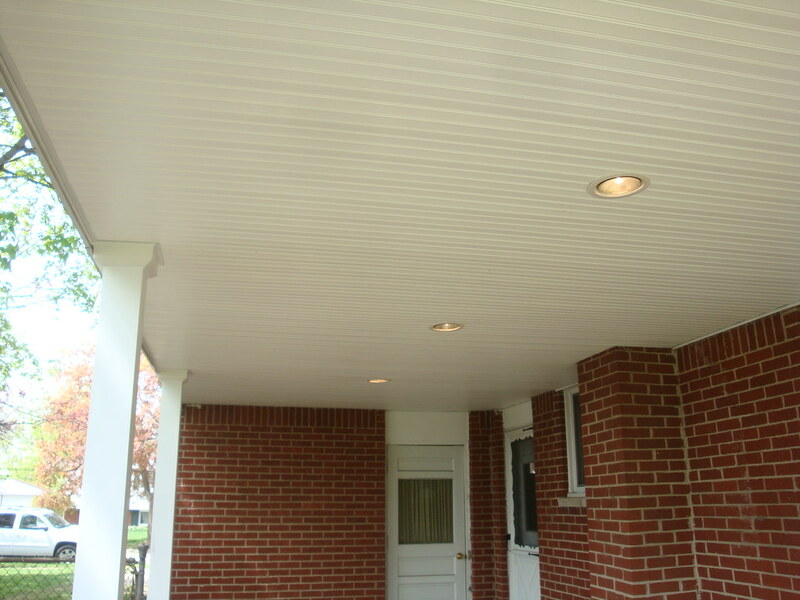 Venting a cathedral or vaulted ceiling with fiberglass and soffit baffles from eave to ridge. 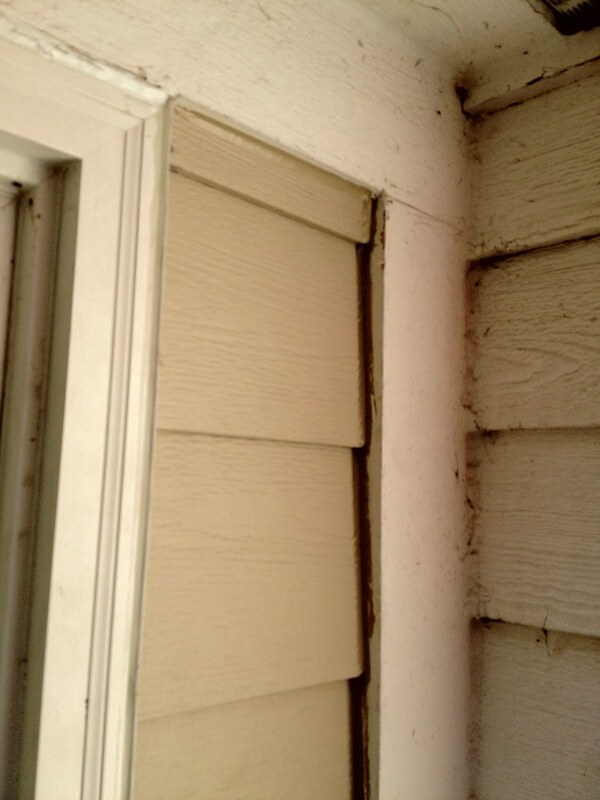 Vinly siding has been removed and a hole has been drilled thru the fanfold insulstion. 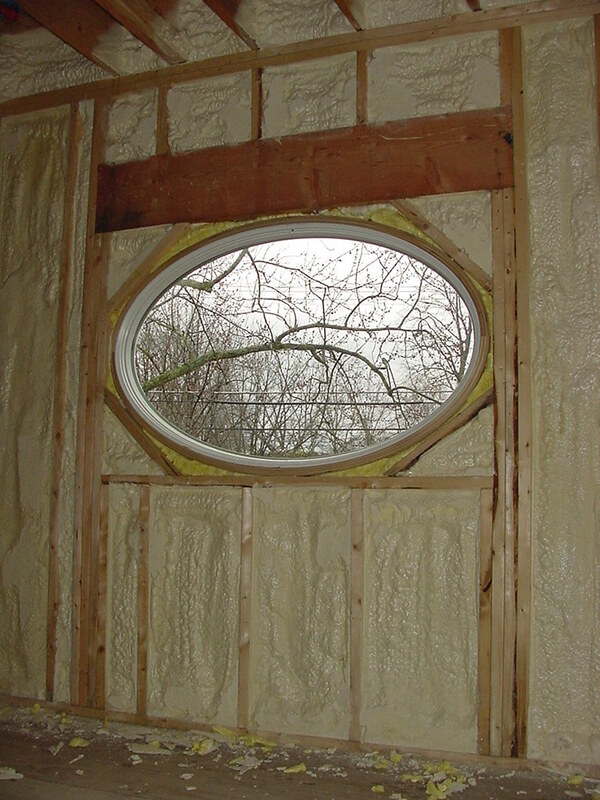 This hole will now be injected with inplace foam into each wall cavity. 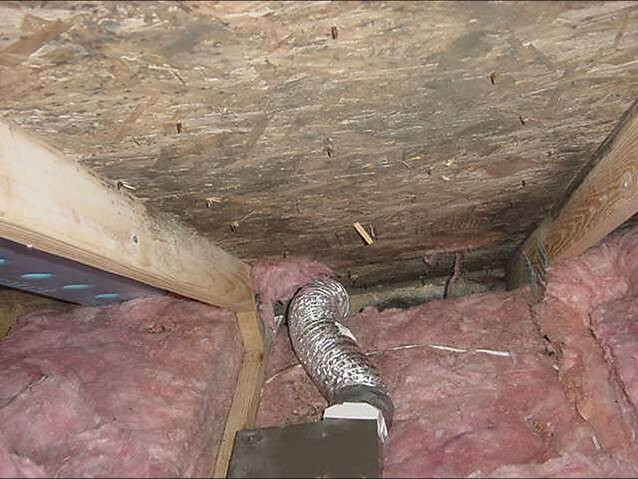 This is what happens when there is a lack of intake air flow combined with too much insulation at the soffits. We know how to correct it though! 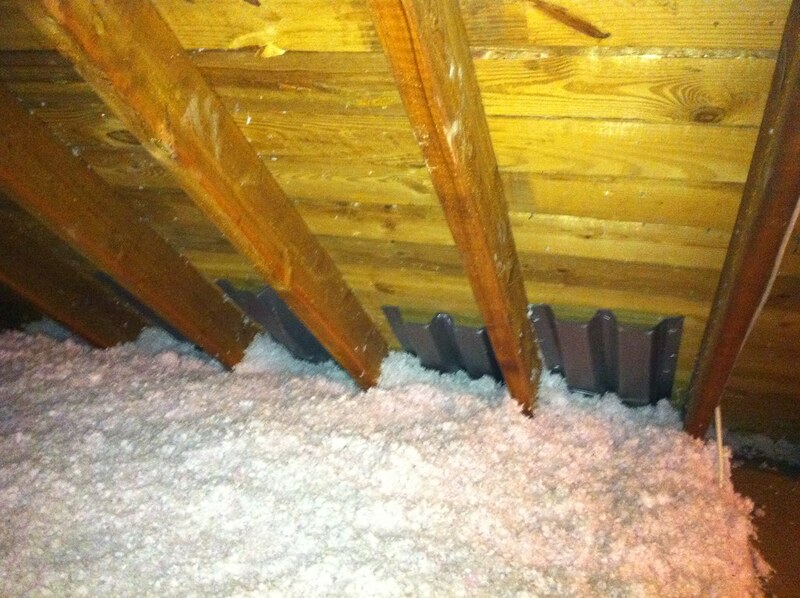 Soffit baffle and figberglassinsulation are in place in this attic. 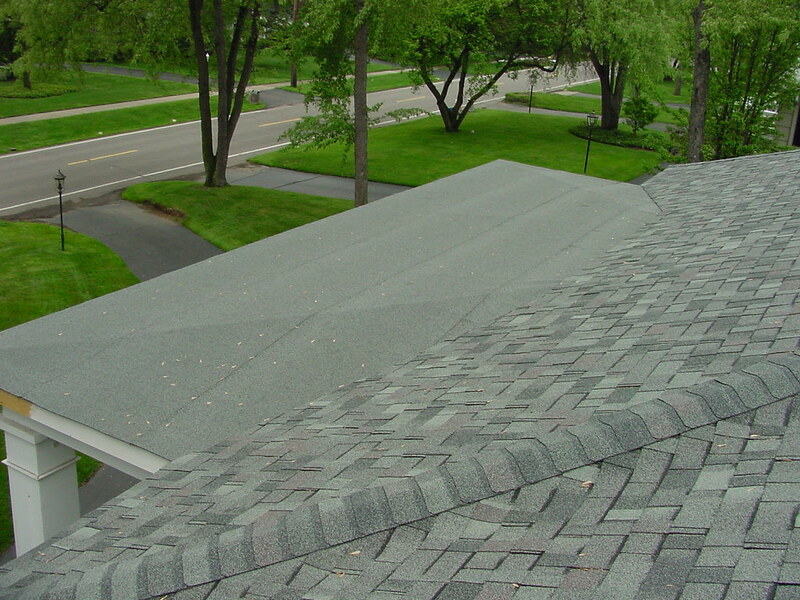 Not our first choice for product, but this is how is should look if don properl. 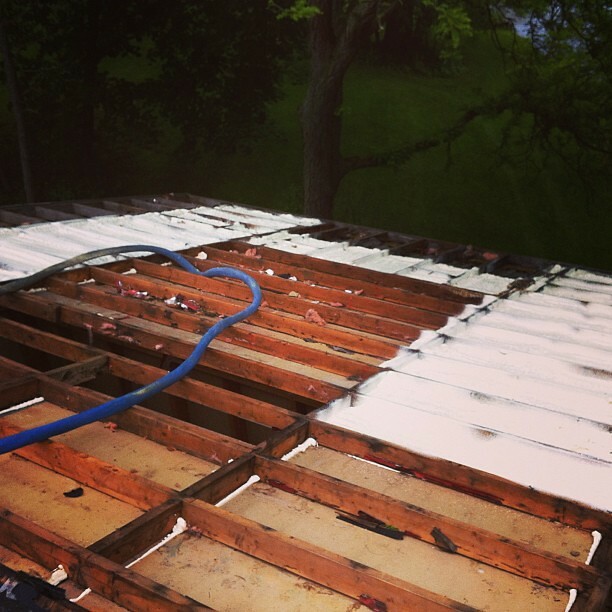 Pulling insulation on this cathedral ceiling. 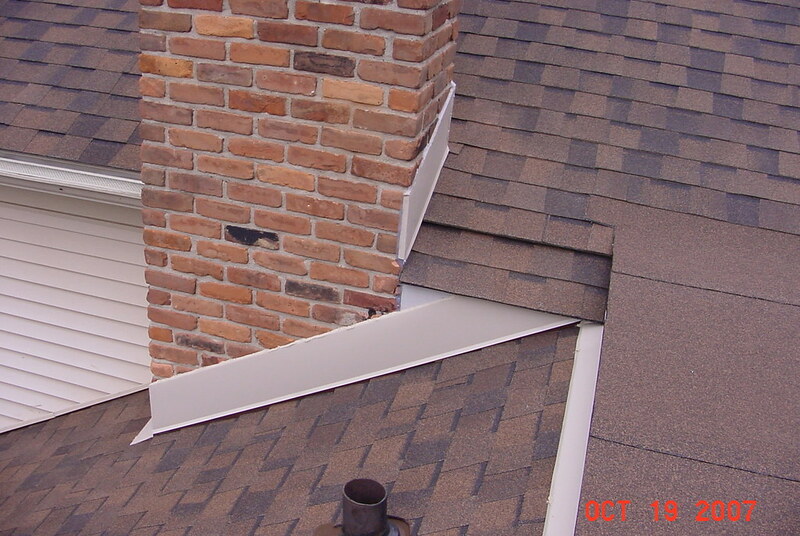 Because there was no ventilation this attic was condensating every winter causing major ice dams.